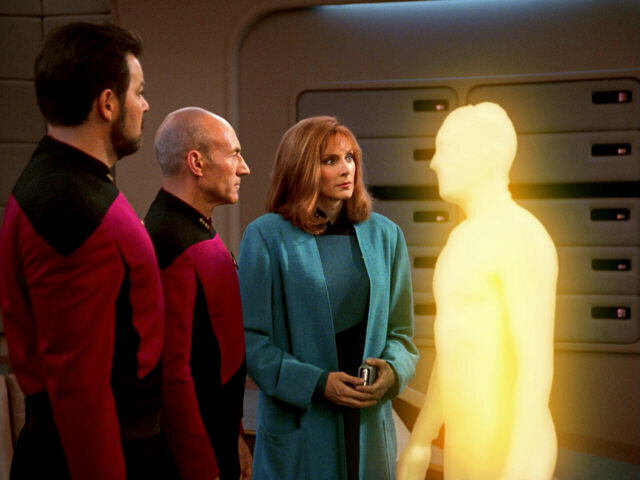 Ex Astris Scientia - Observations in TNG: "Transfigurations"
Here are some observations about sets, props and visual effects in TNG: "Transfigurations" without a specific theme, and a comparison of the original TV release (TNG) with the remastered episode (TNG-R). 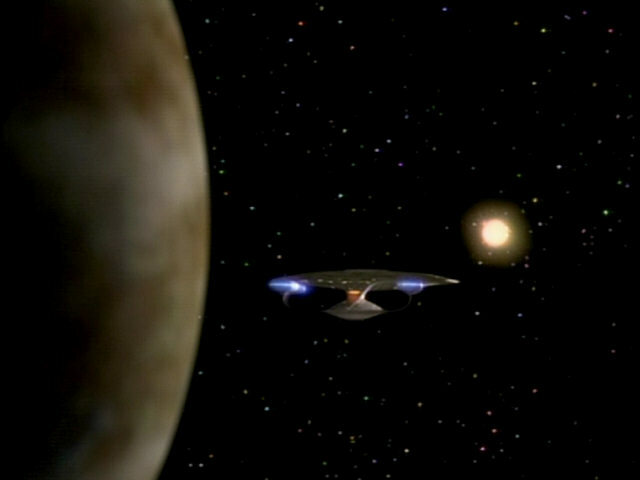 The unnamed sun and planet in the Zeta Gelis cluster previously appeared as the sun Delos and its planet Brekka in "Symbiosis". 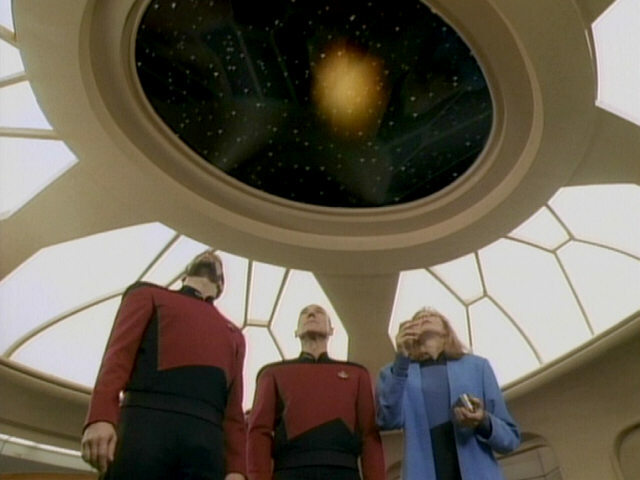 Re-Used Planets in TNG A new planet was created for the TNG-R episode. 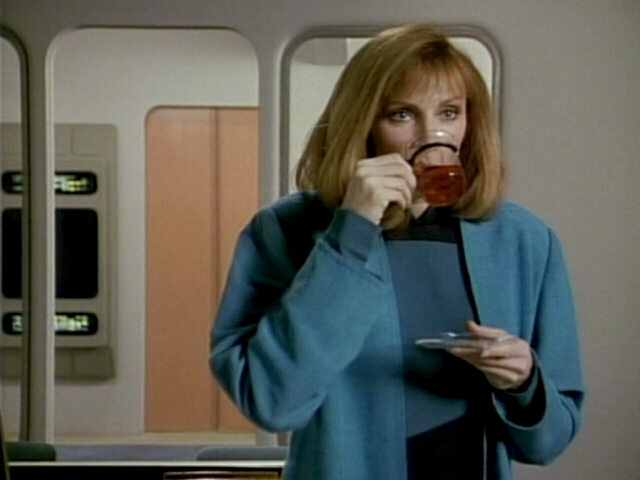 It is not the same as Brekka. 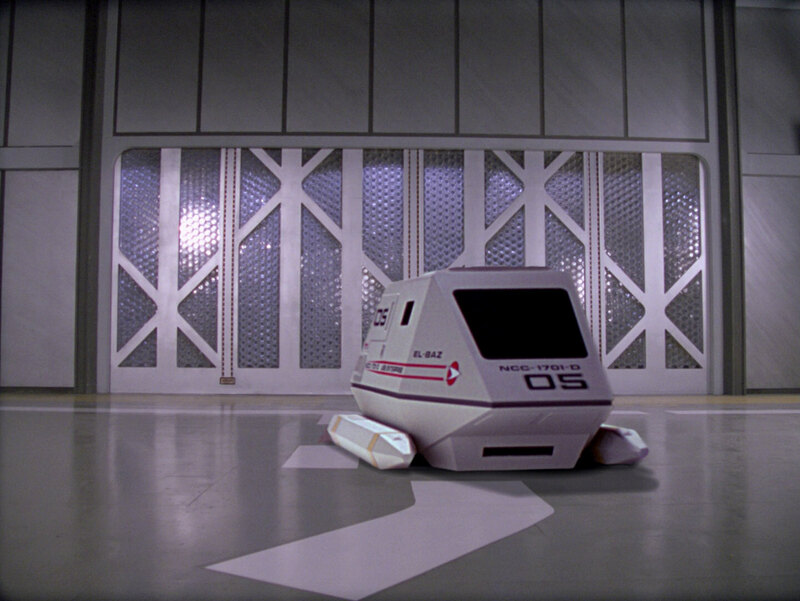 The Zalkonian escape pod is a re-use of Kivas Fajo's shuttle, seen aboard the Jovis in "The Most Toys". 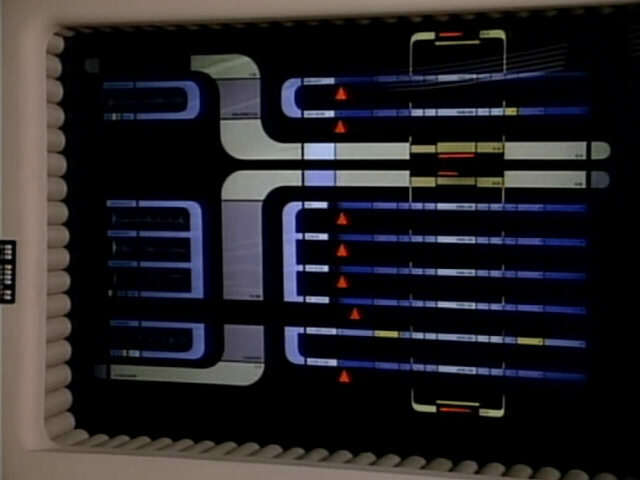 "The Most Toys" We can recognize more details, such as the grating in the aft wall, in HD. 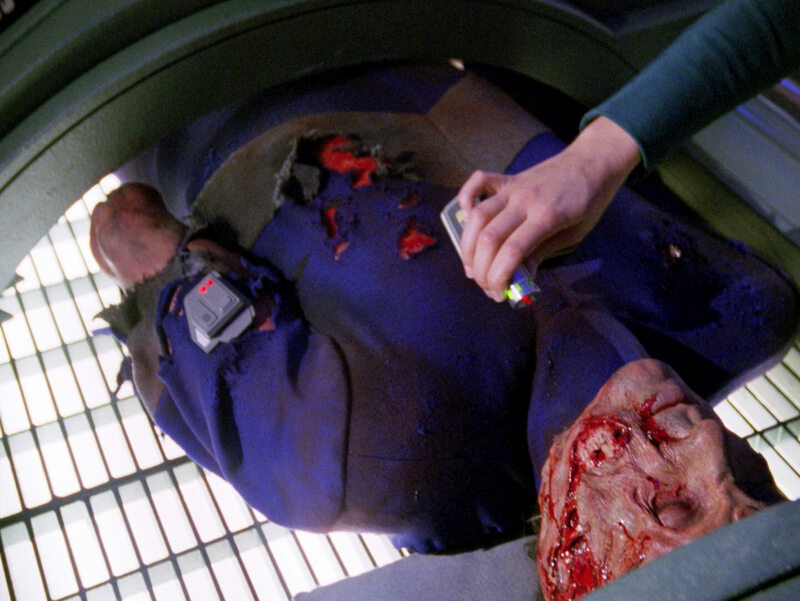 John Doe's wounds are unusually severe. 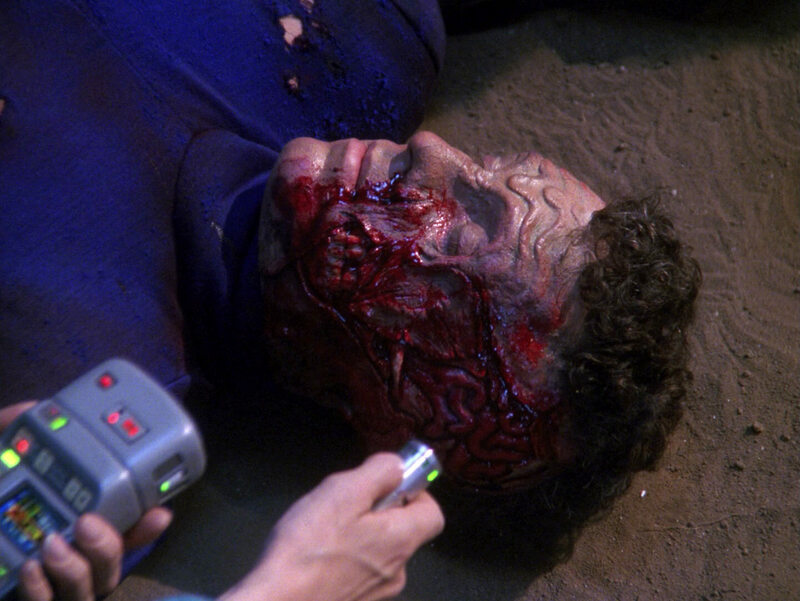 His brain is visible through his open skull and his molars can be seen through his open cheek. 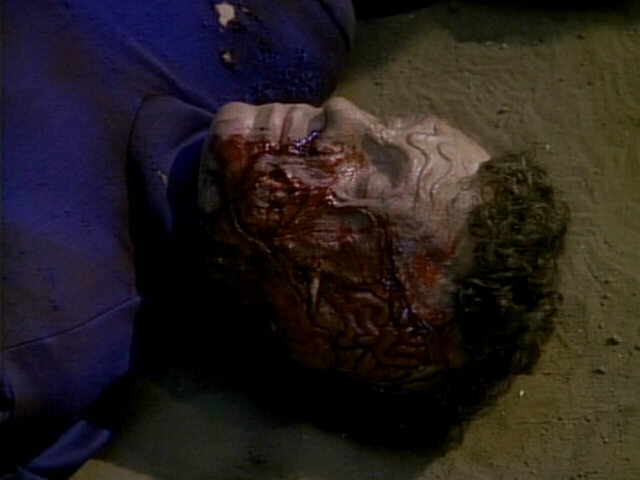 The gruesome make-up in HD. 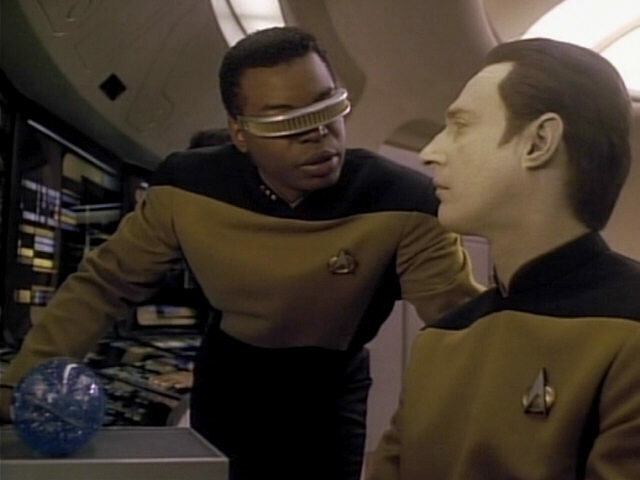 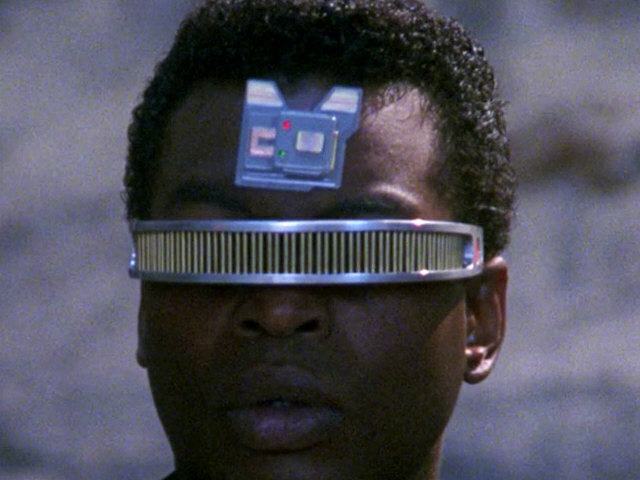 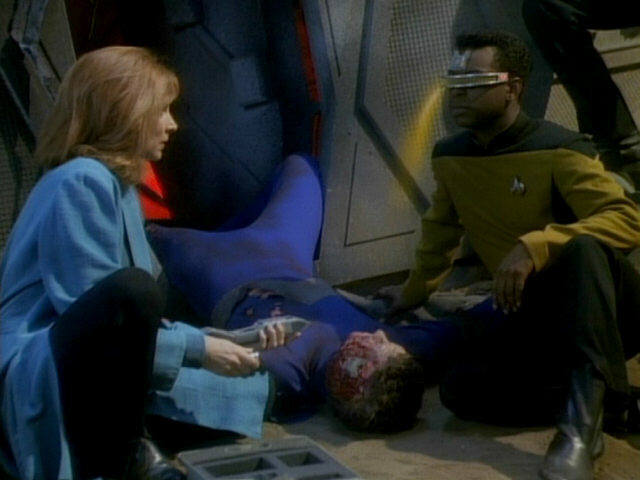 In order to hook up Geordi's nervous system with that of John Doe, she attaches an extension to her medical tricorder. 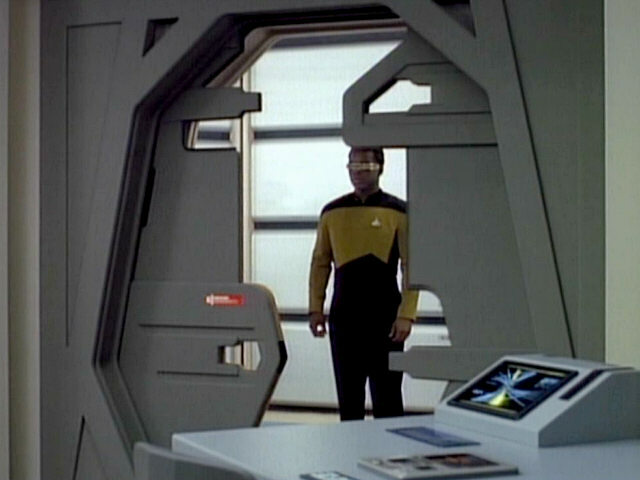 This extension appears only in this episode. 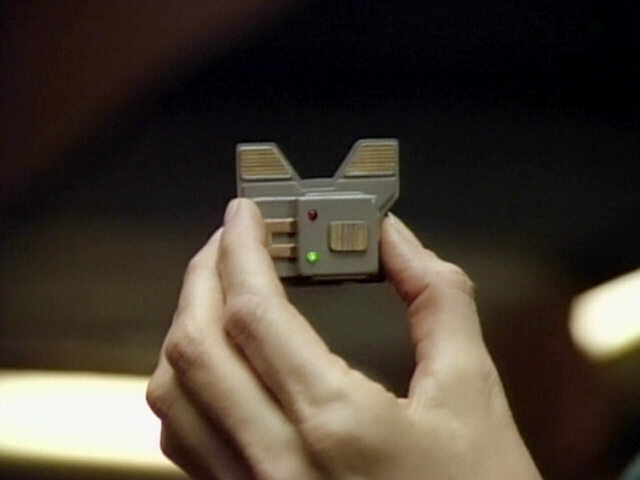 Beverly's devices in HD close-ups. 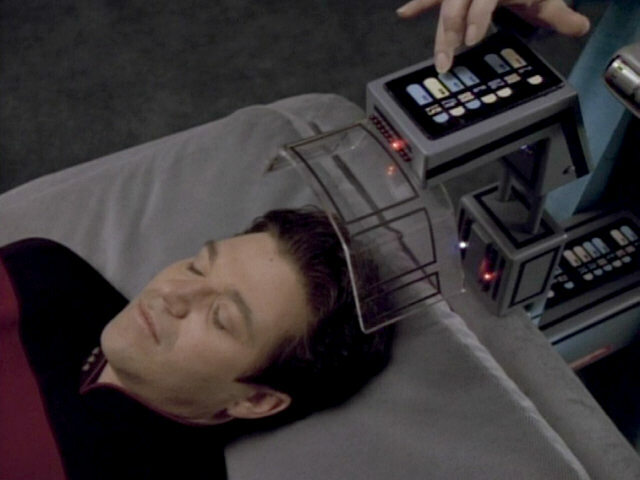 The small devices that link the two neural systems later appear in "Night Terrors" as cortical scanners. 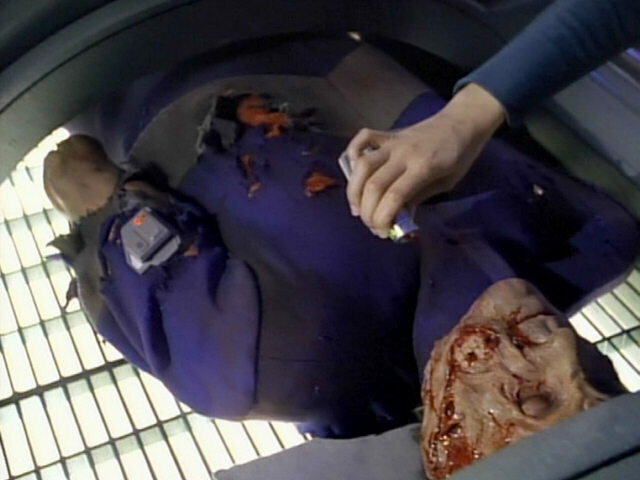 Another look at John Doe's severe injuries, showing his amputated arm. 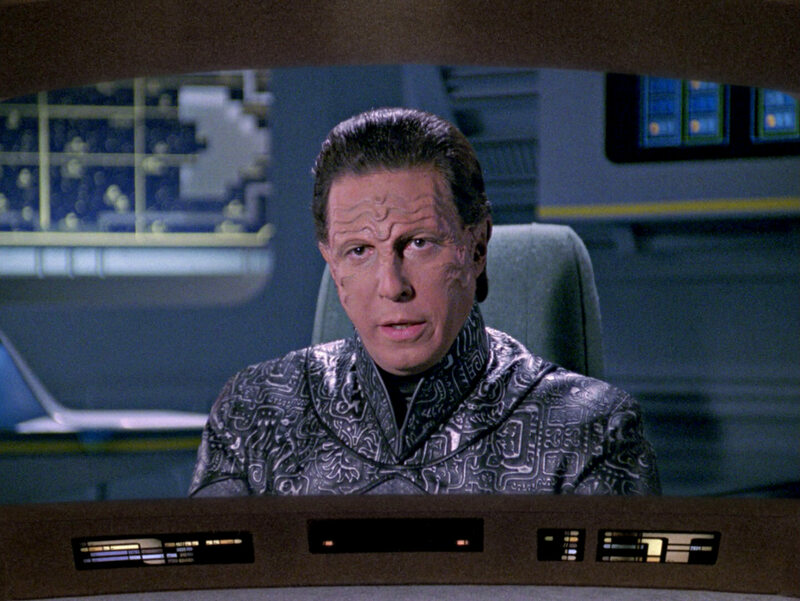 Another look at the make-up in HD. 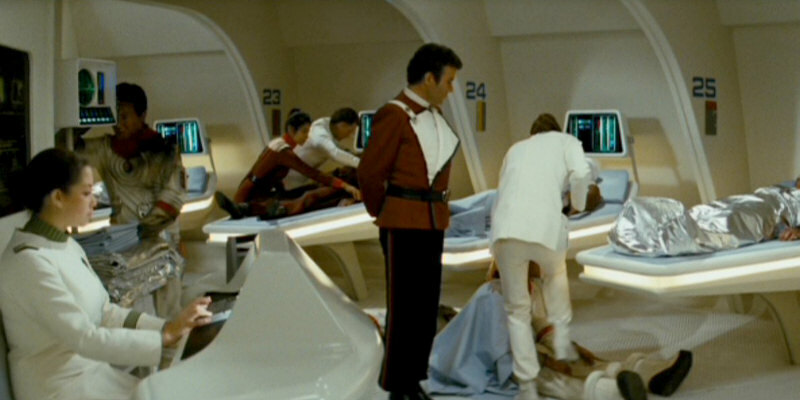 The emergency biosupport unit in which John Doe is lying here originally was a cloning unit on Mariposa in "Up the Long Ladder". 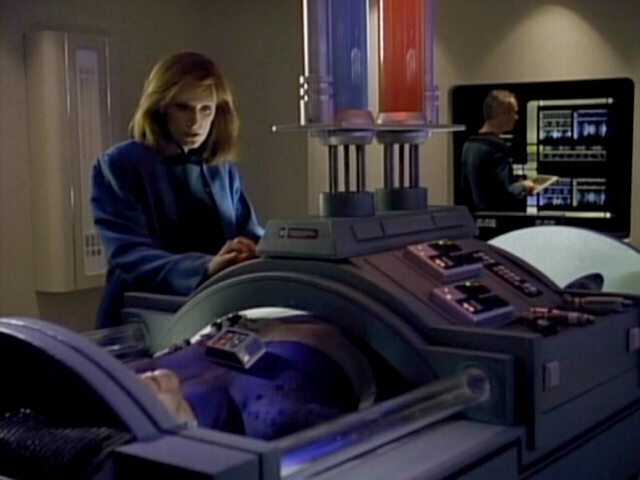 It appears again as a medical bed in "The Best of Both Worlds II" and "Ethics". "Ethics" A look at the unit in HD. 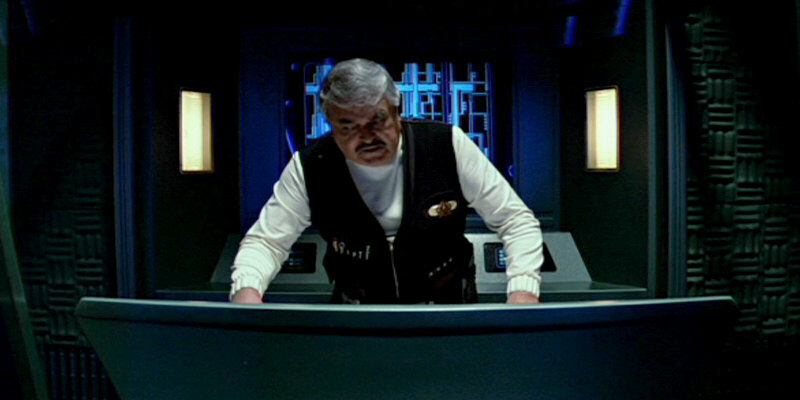 The console in the background was originally created for the transporter room of the USS Enterprise-A, seen in "Star Trek V: The Final Frontier". 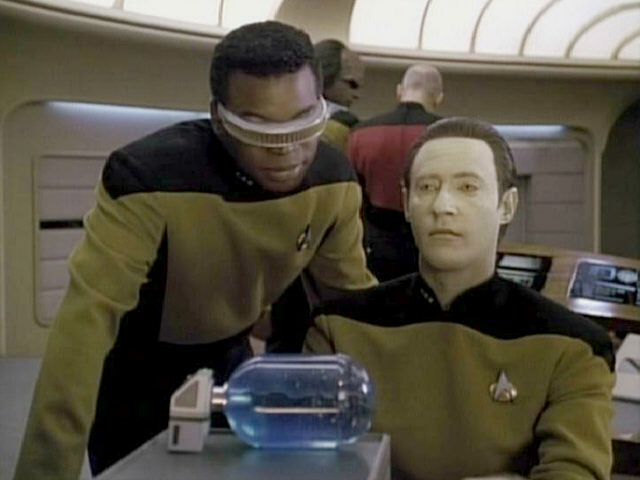 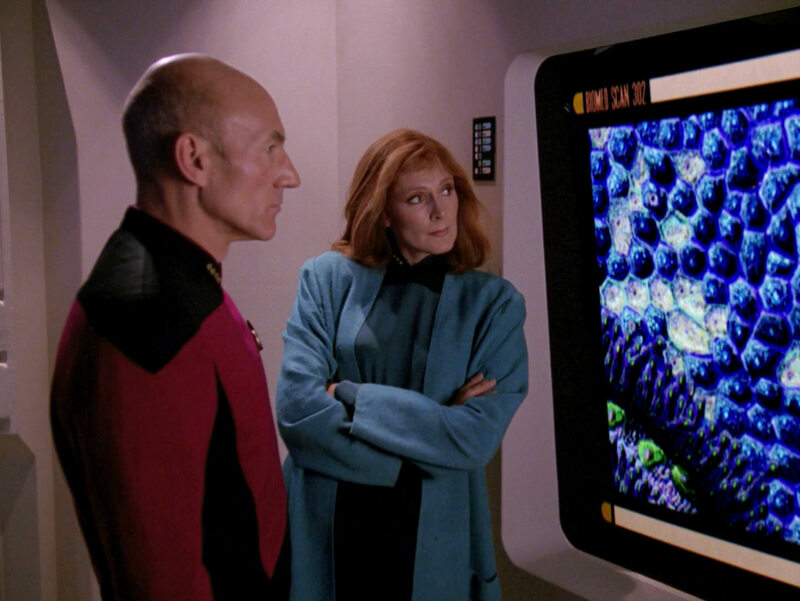 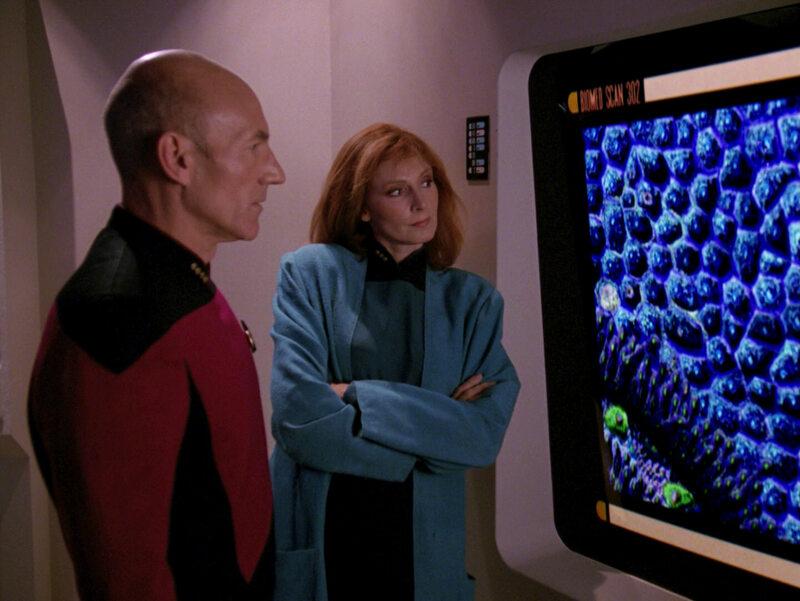 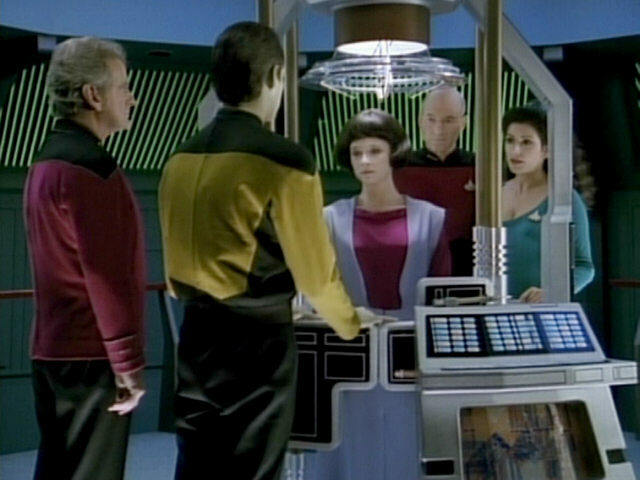 It first appeared on TNG in the computer room in "The Measure of a Man" and was from this episode on a fixed part in the science lab first seen in this episode. 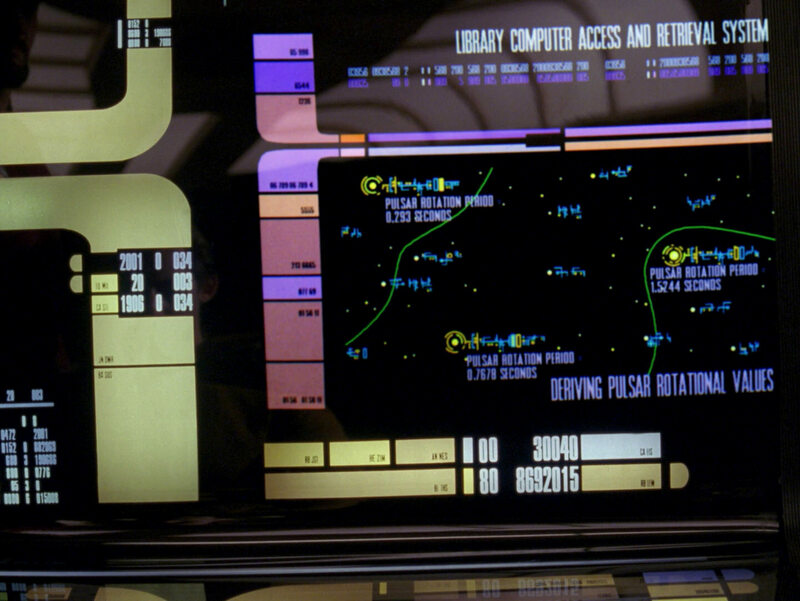 "Star Trek VI" The headline reads "Patient Status", but we can't read all the small writing even in HD. 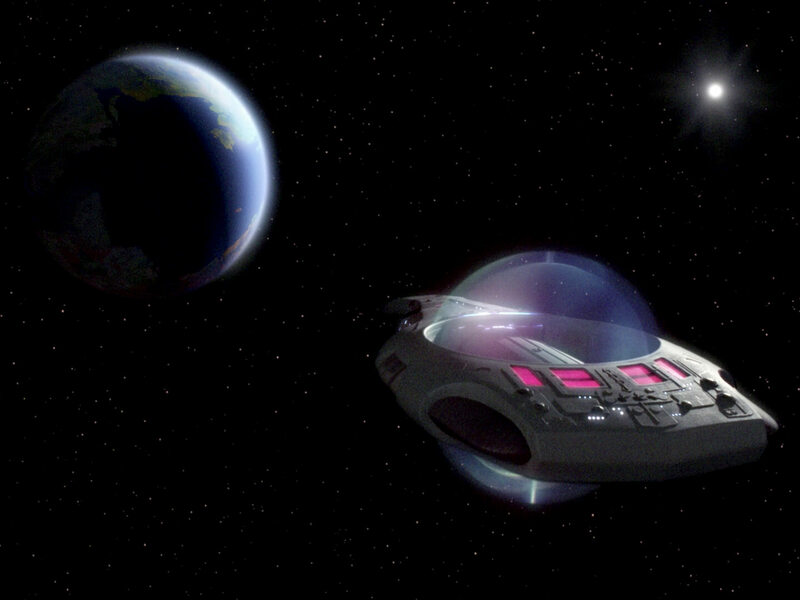 This second shot of the planet in the Zeta Gelis cluster also originally was Brekka in "Symbiosis". 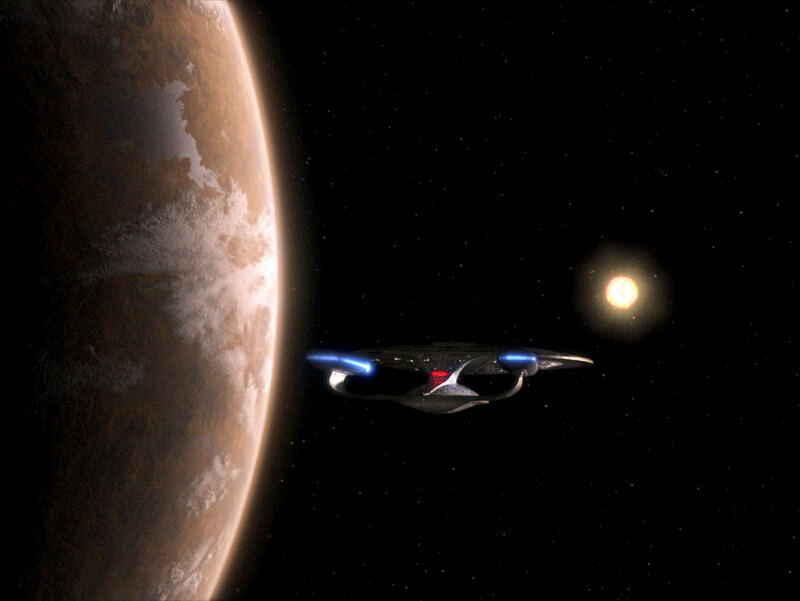 Another good look at the new planet in HD. 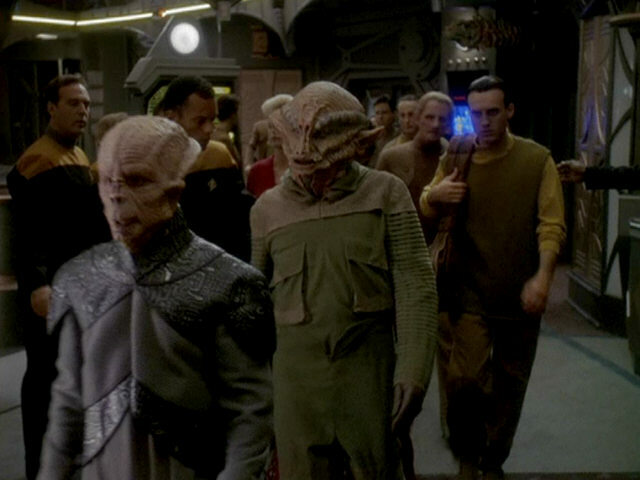 The large console in the background first appeared in the lab on the Ferengi Marauder in "Ménage à Troi". 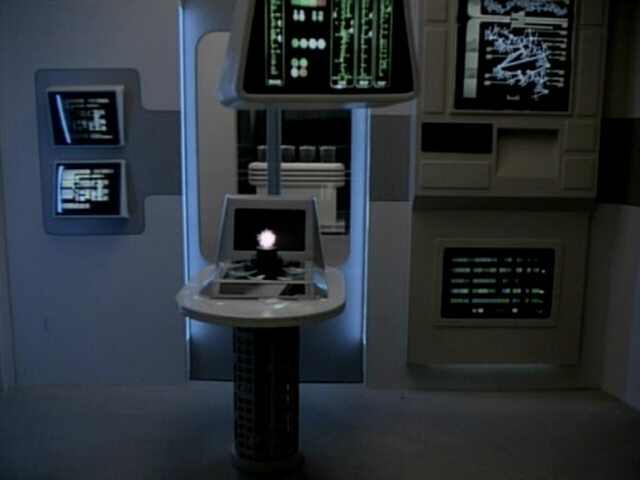 This is another console that would remain in the science lab until the end of the series. 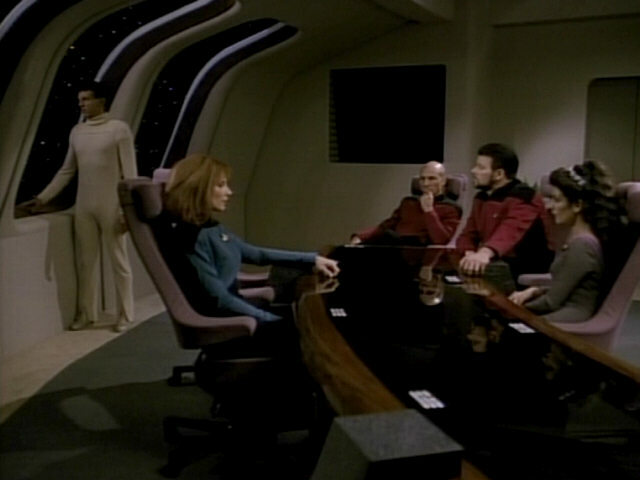 "Ménage à Troi" A better look at the console in HD. 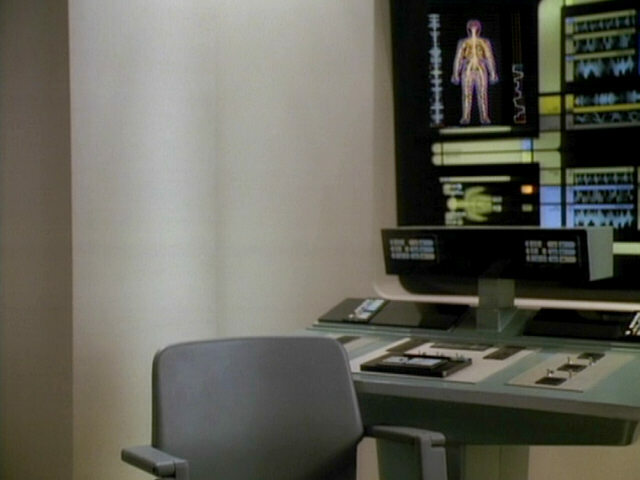 The small device attached to the desk was originally a part of the medical device Pulaski used on Riker in "Shades of Gray". 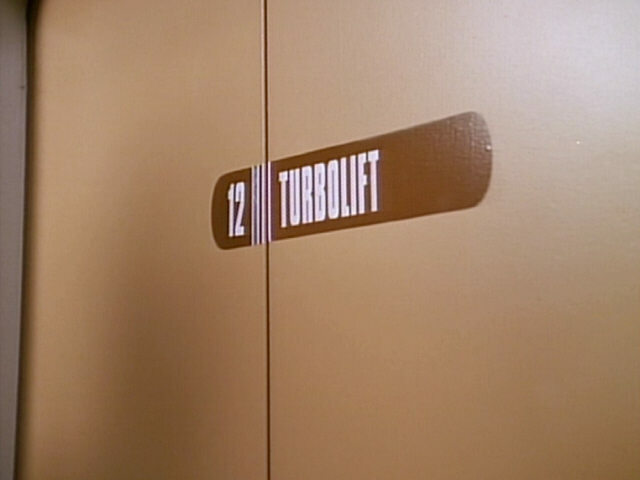 It appeared again in "Conundrum". 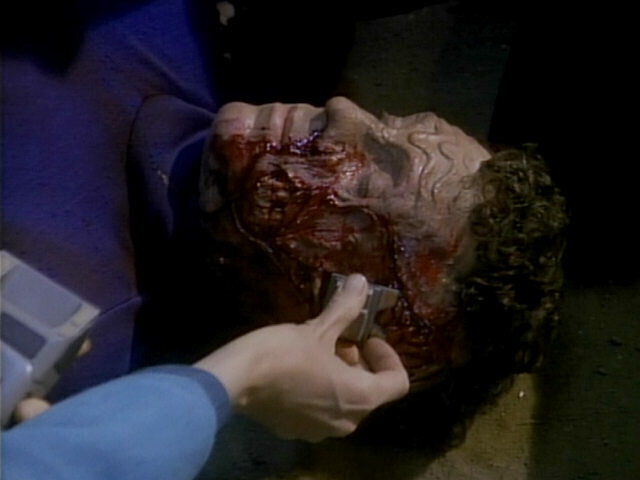 The left half of John Doe's face is covered with a large medical patch. 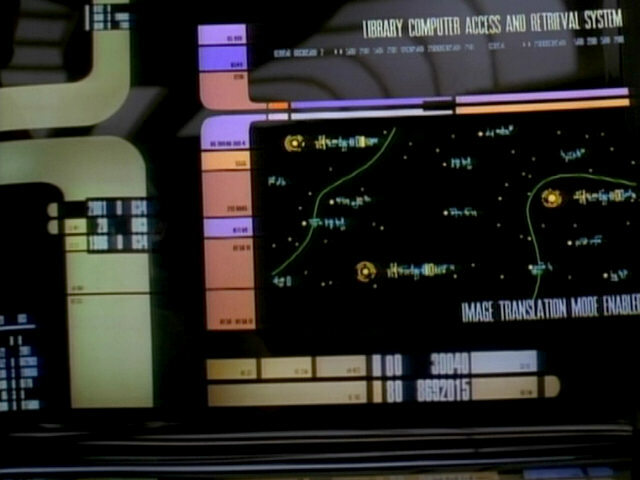 A close-up of the patch in HD. The two wall consoles in the medical lab originally appeared in the smaller medical lab in "Home Soil". 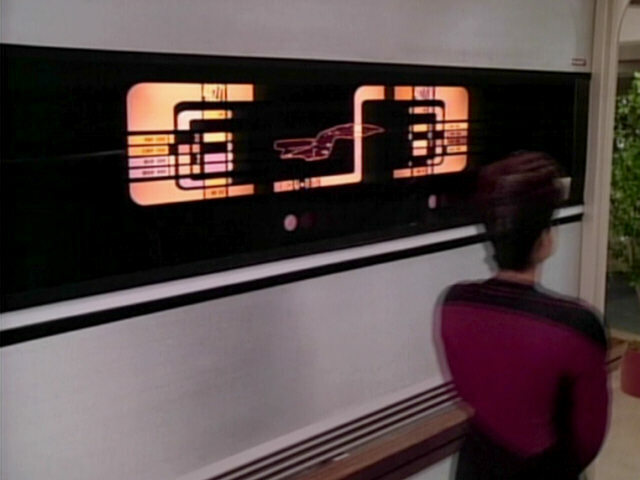 They displayed the same graphics, although the translights must have been changed as the colors are different. 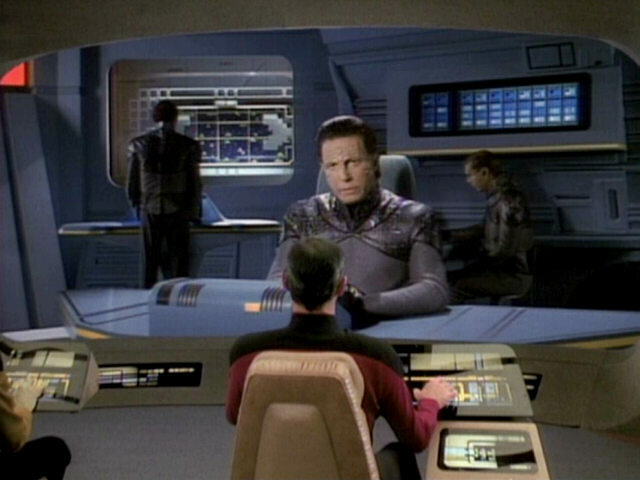 The graphic on the left is a modification of the polywater graphic created for "The Naked Now" while the graphic on the right is usually displayed by a small monitor often seen in Crusher's sickbay office. 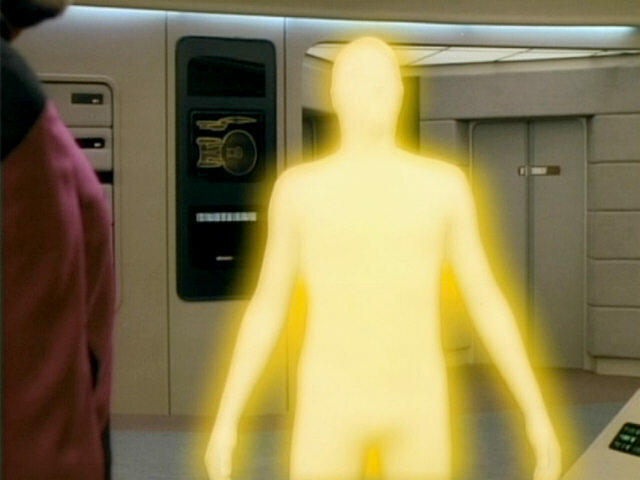 The graphic shows the cell regeneration in John Doe's body. 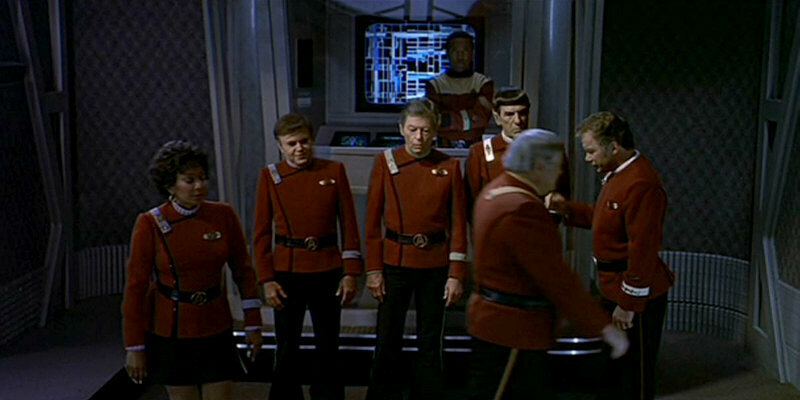 When the shot was filmed, the camera moved slightly to the right. 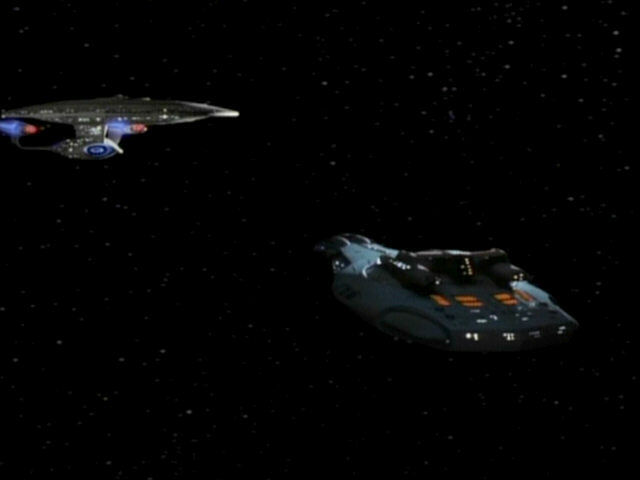 The graphic display, added in post production, wasn't moved likewise, so it graphic jumps around when comparing the two screenshots in quick succession. 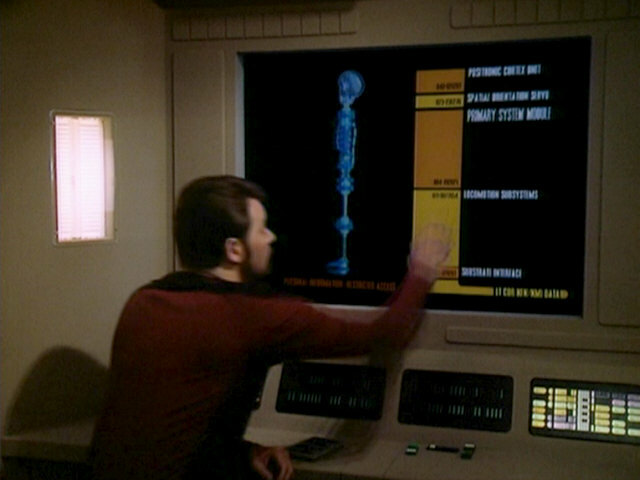 The display as it appears in HD. 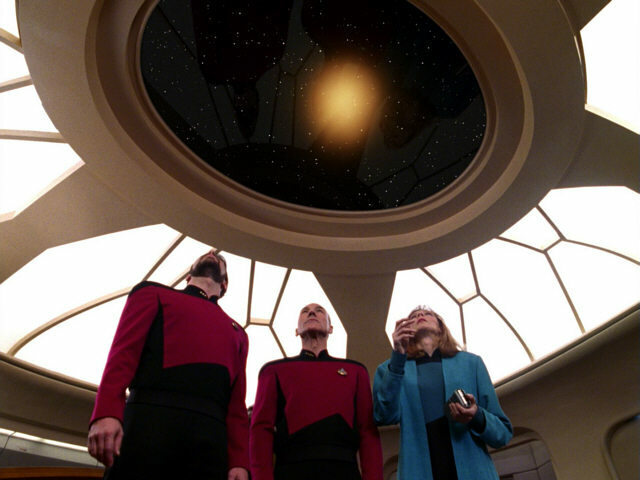 It doesn't jump around any more. The console to the left of Beverly was earlier seen in the cybernetics lab in "The Offspring". 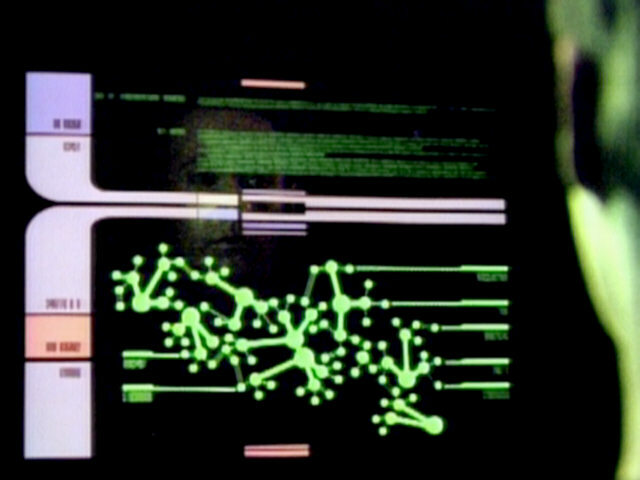 "The Offspring" An HD close-up of the console. 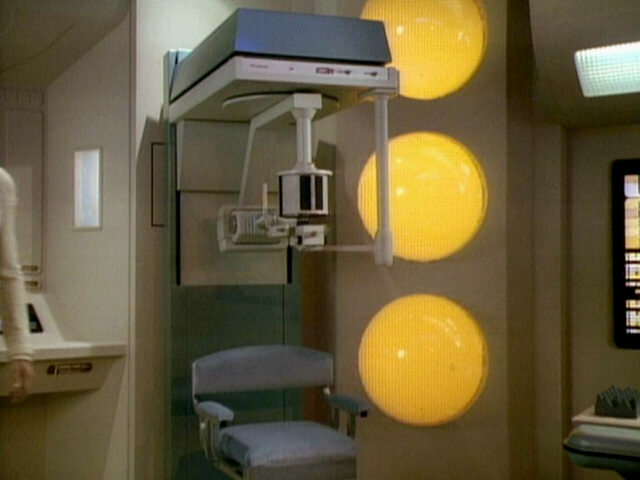 This shot of a large medical monitor was re-used from "Time Squared". 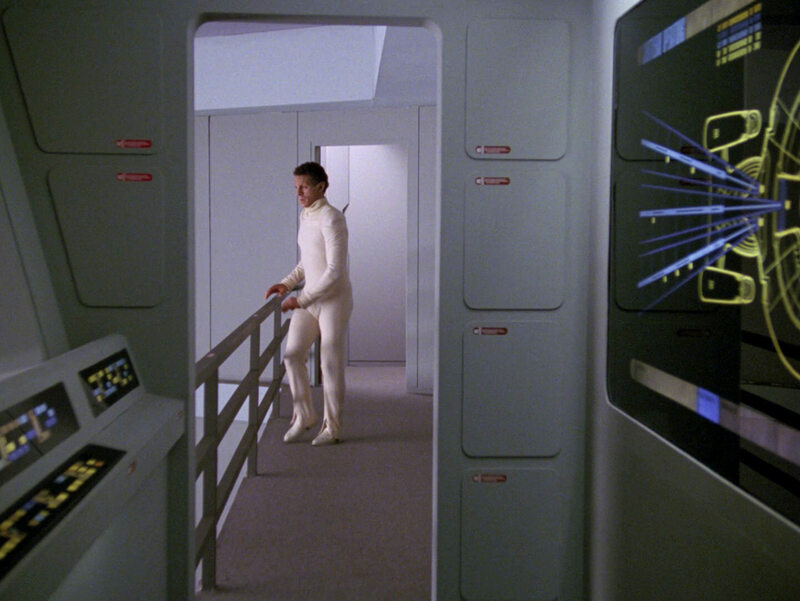 It shows the large medical display in sickbay. 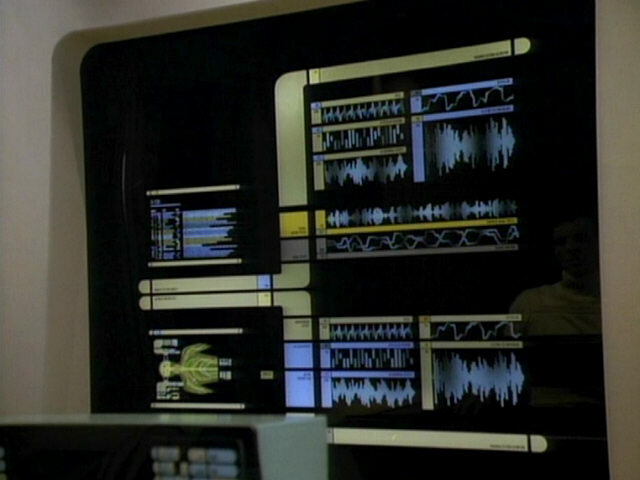 The console Crusher faces when she looks at the display was seen earlier in the episode, it has a different medical interface. 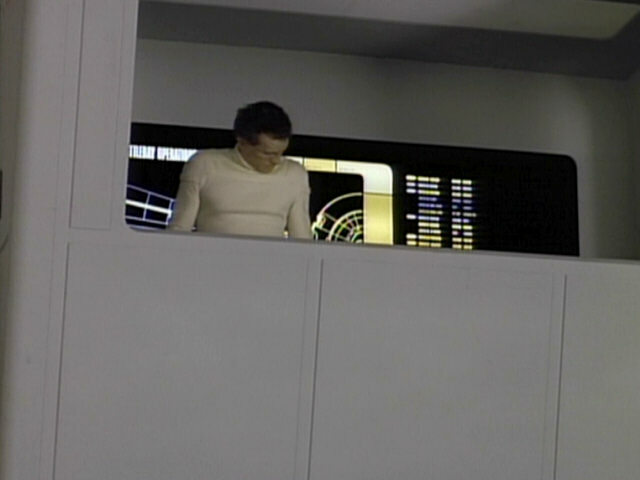 The LCARS display of the large sickbay display was changed between seasons 2 and 3 and also looks different now, as can be seen in the screenshot from "The Vengeance Factor". 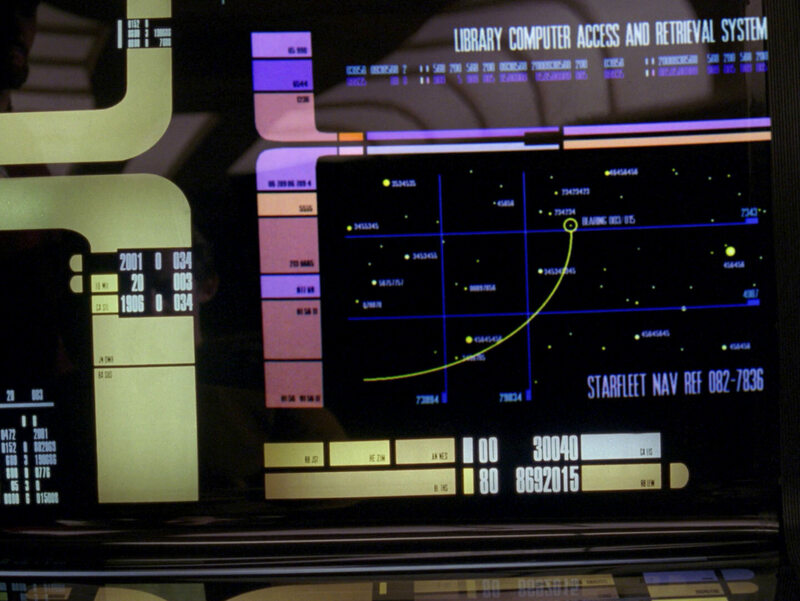 in this episode We can almost read some of the small writing in HD. 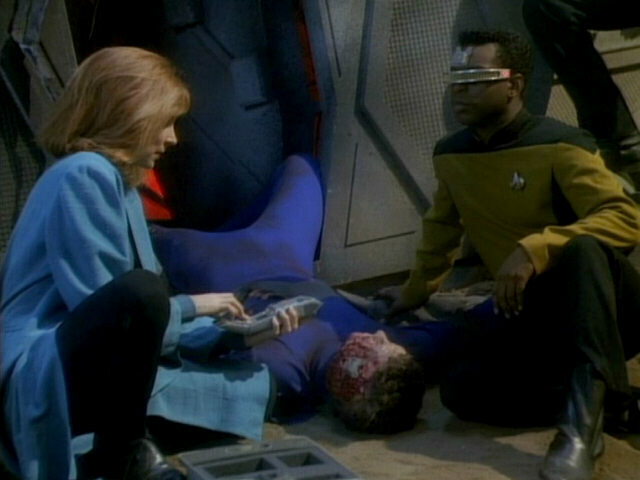 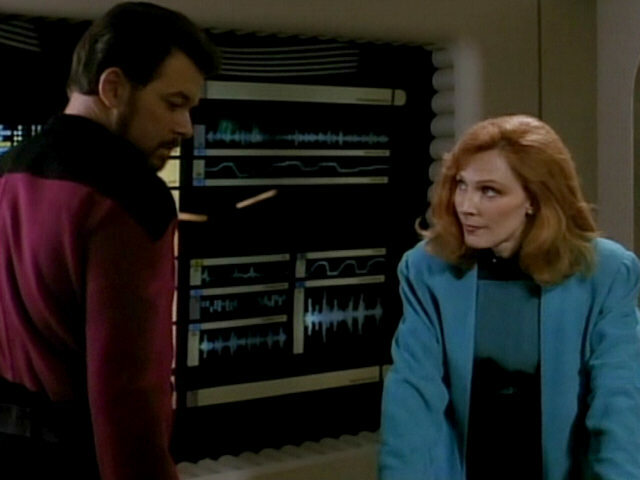 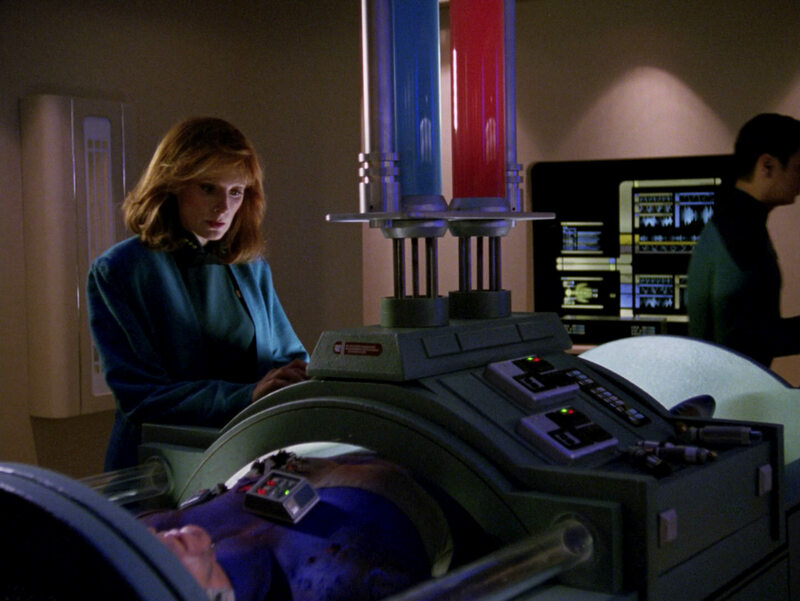 Doctor Crusher uses a medical device to heal John Doe's wounds. 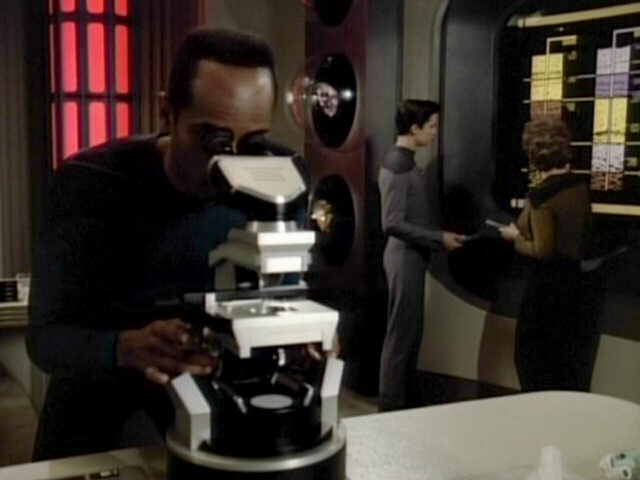 The medical lab, which later often appeared as the science lab or stellar cartography, was one of the last recurring sets created for TNG. 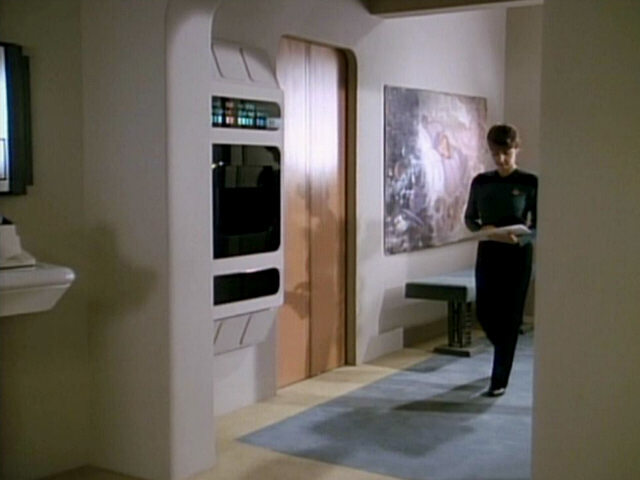 As can be seen in the screenshot from "Homeward", the set remained more or less the same until the end of the series. 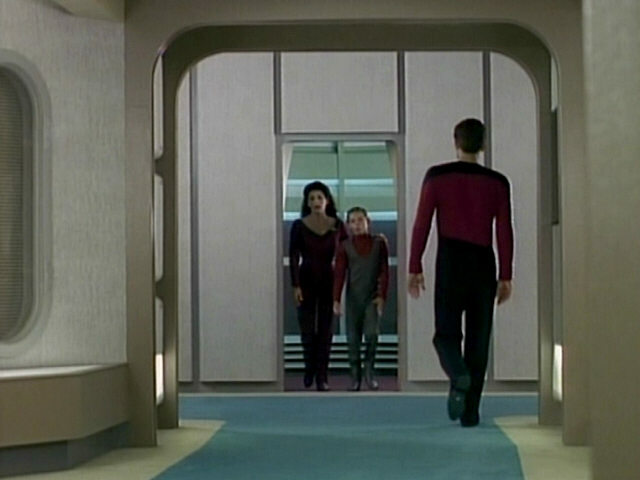 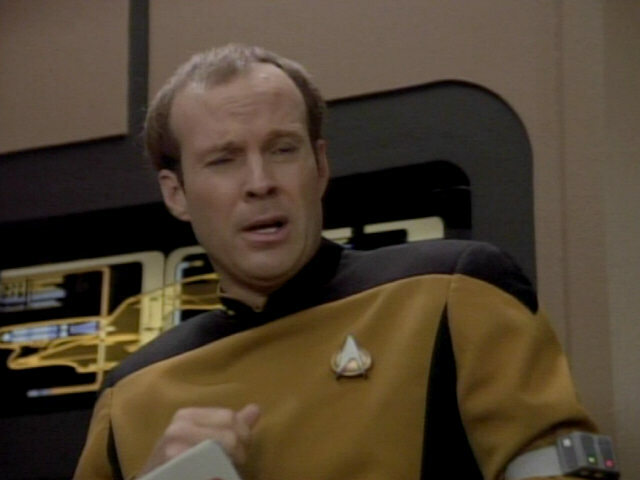 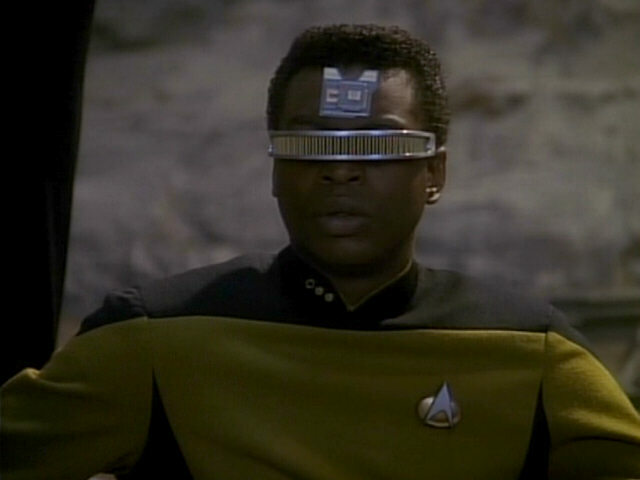 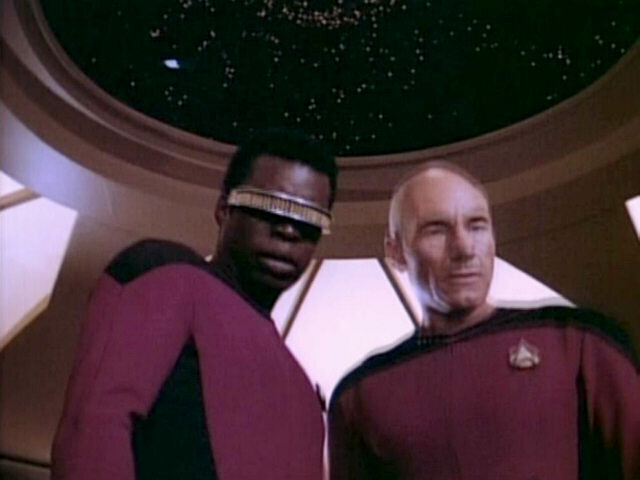 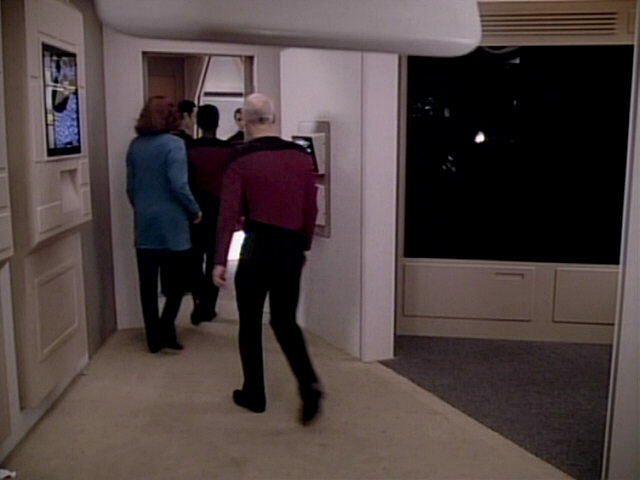 "Homeward" The effect as it appears in TNG-R. 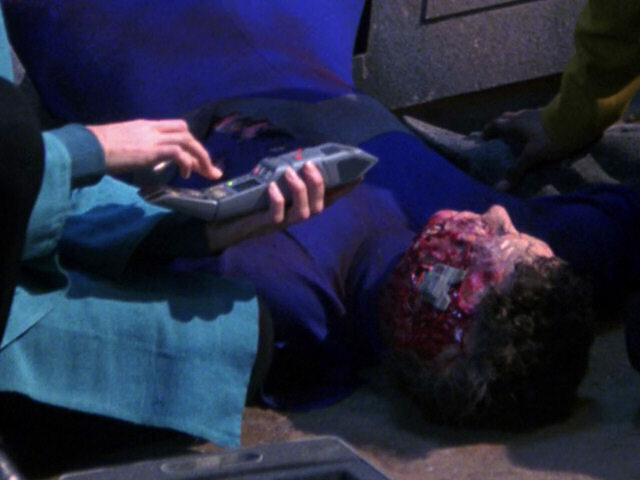 The motor assist bands were later re-used in "Realm of Fear" as monitoring devices. 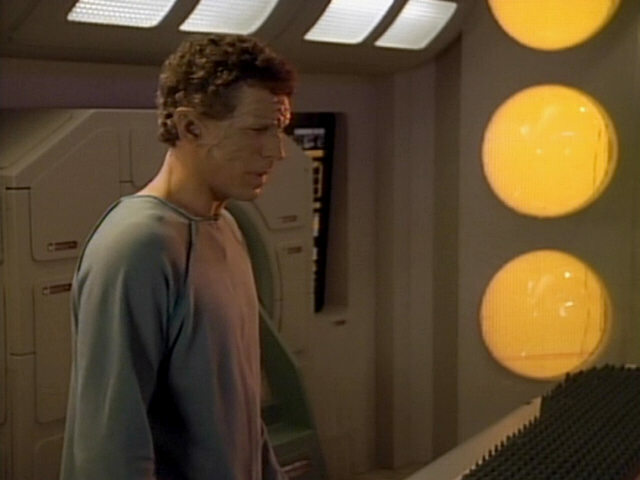 "Realm of Fear" The devices in HD, plus a first good look at John's "healthy" make-up. 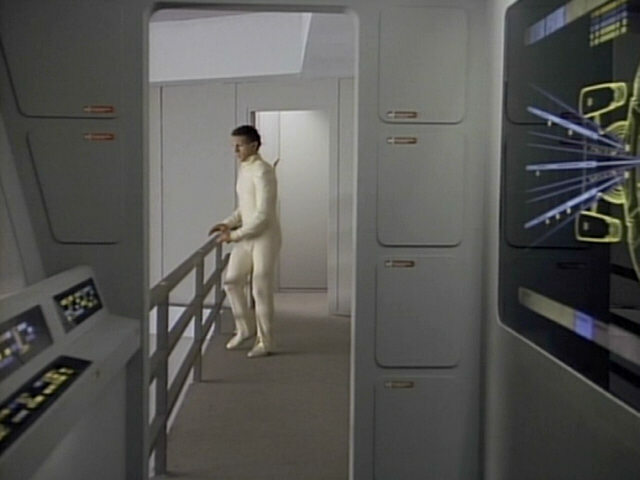 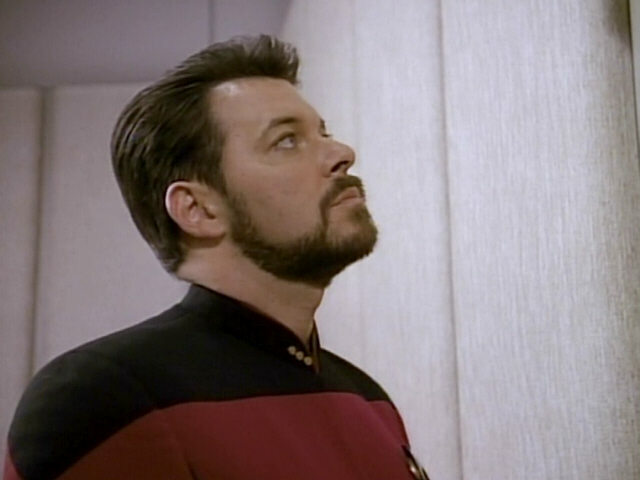 Riker waits in front of the turbolift located close to the starboard Ten Forward entrance. 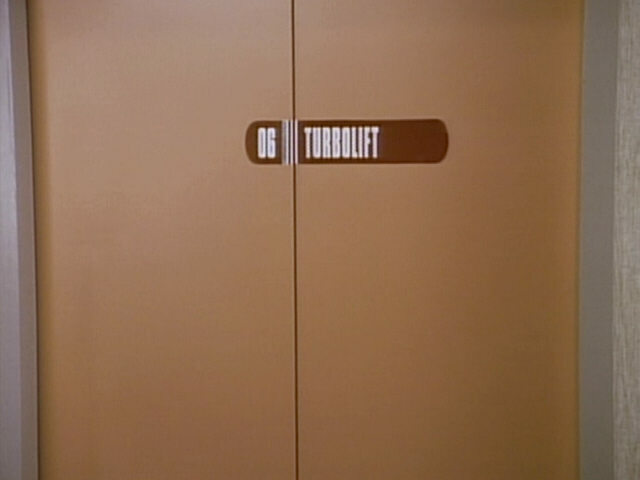 He enters the turbolift on deck 12 and leaves it on deck 6. 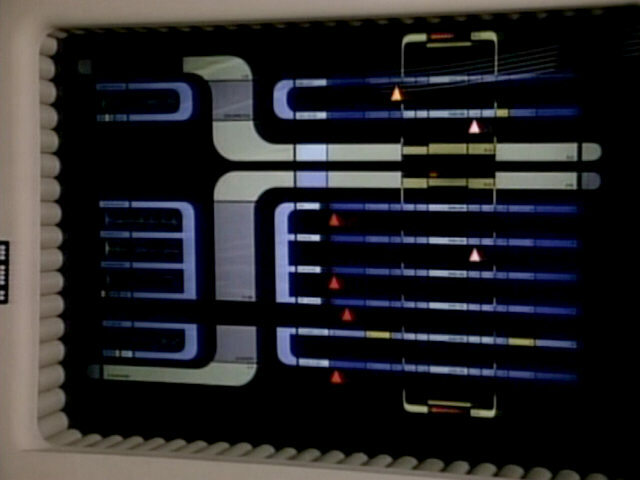 The sickbay replicator strangely displays a Zibalian graphic. The prop was removed from sickbay for the filming of "The Most Toys" where it was used on the Zibalian ship Jovis, but it was returned after filming that episode and appears as a regular Starfleet replicator in "Sarek". 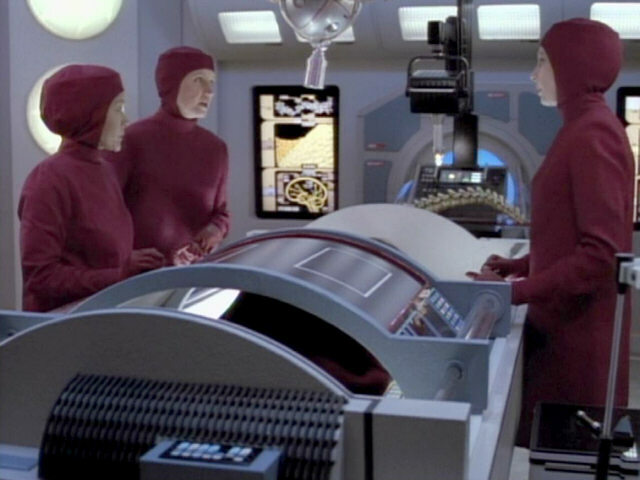 It is possible that this happened due to necessary refilming after David Rappaport (the first actor to play Kivas Fajo) attempted to commit suicide and several scenes from "The Most Toys" needed to be refilmed with Saul Rubinek as Kivas Fajo after "Sarek". 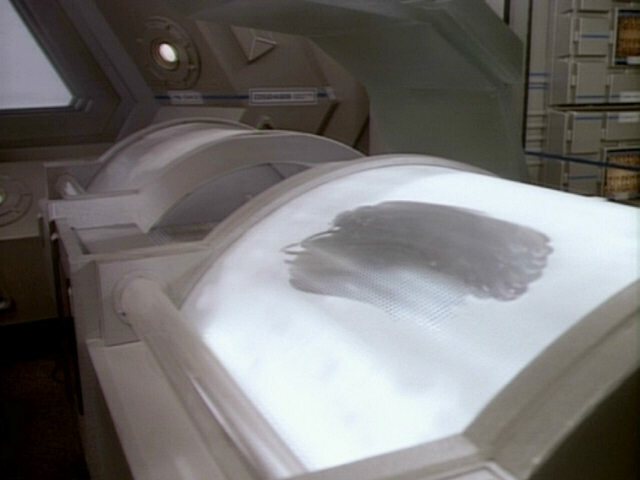 Maybe it was forgotten to remove the Zibalian graphic when the prop was needed again for "Transfigurations". 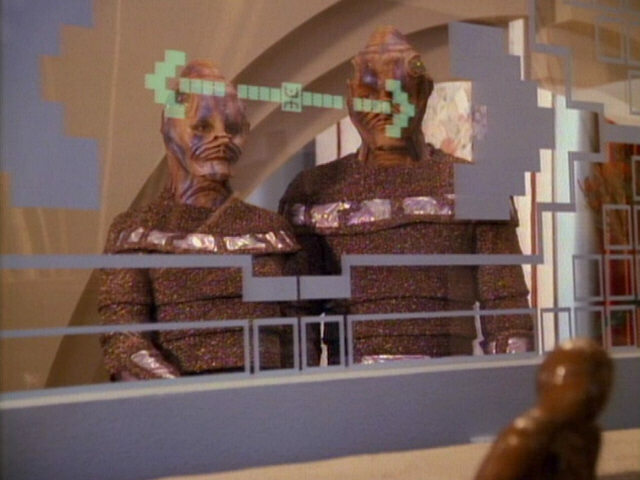 "Sarek" We can clearly see the Zibalian writing in HD. 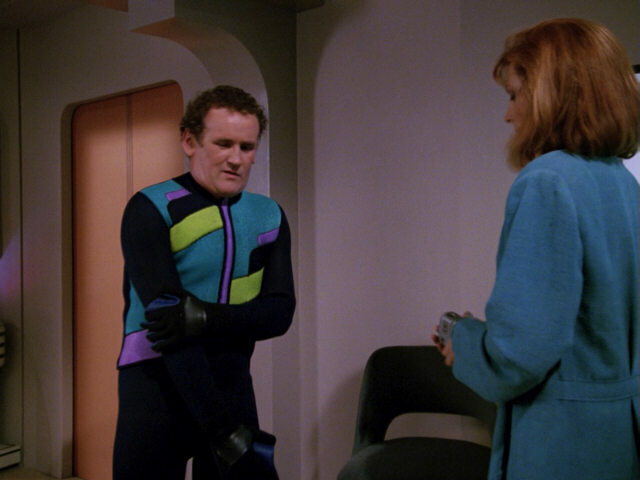 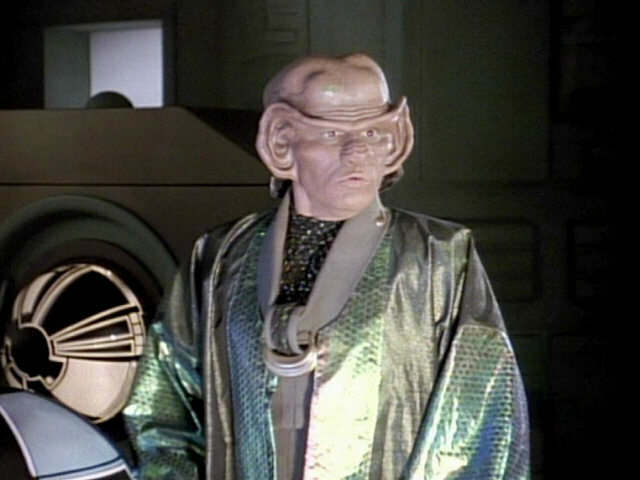 O'Brien wears a similar kayaking outfit in two DS9 episodes, "In the Cards" and "Inquisition". 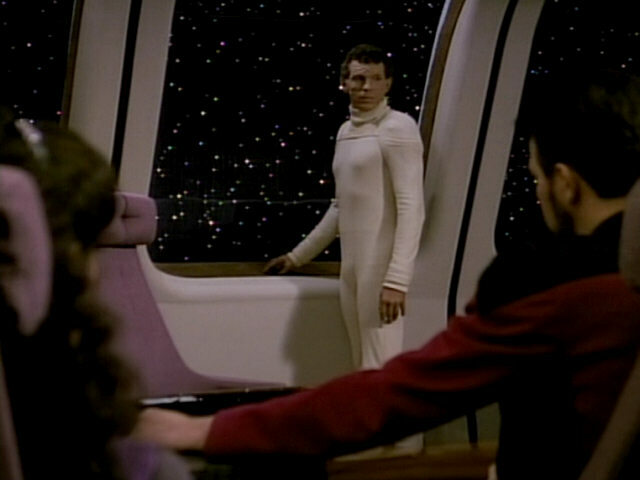 DS9: "Inquisition" The wetsuit as it appears in TNG-R. 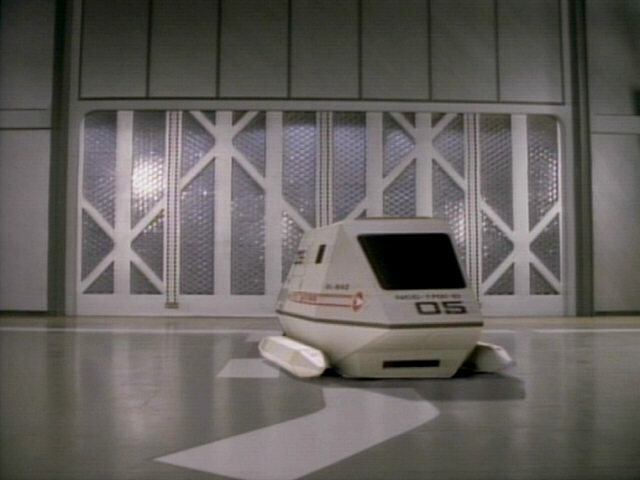 The small platform on the aft bridge station was especially built for this episode so the the Zalkonian storage device wouldn't roll down. 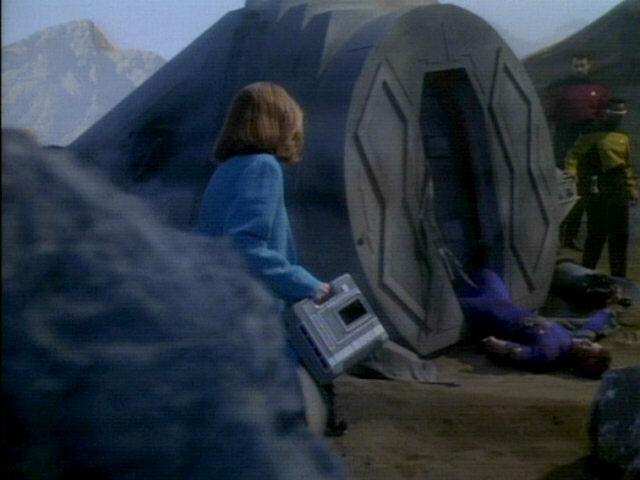 The blue storage device reappeared many years later, on the Mari homeworld in the VOY episode "Random Thoughts". 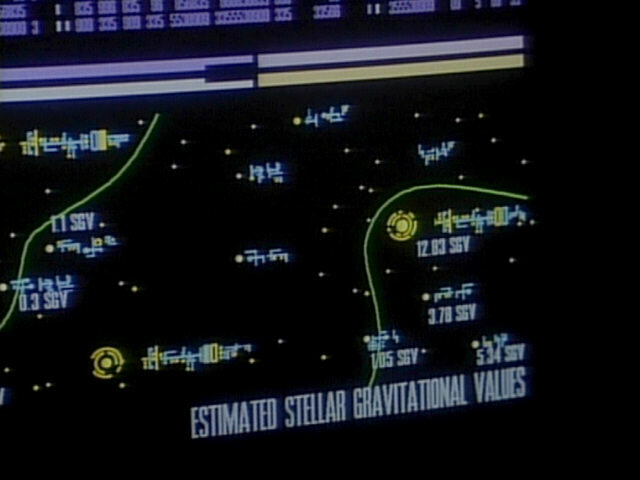 Zalkonian star maps and their English translations. 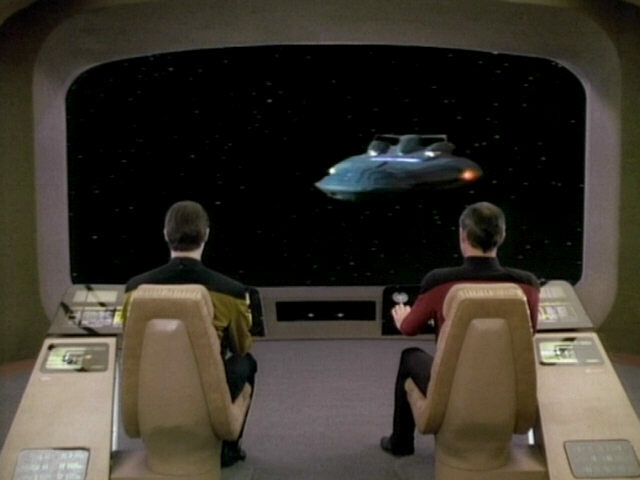 The graphics remain unchanged in TNG-R. 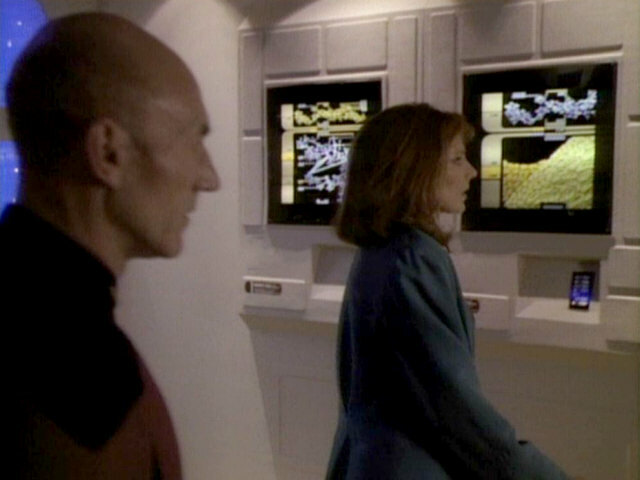 The decorative spheres in the background originally appeared in the geological lab in "Pen Pals". 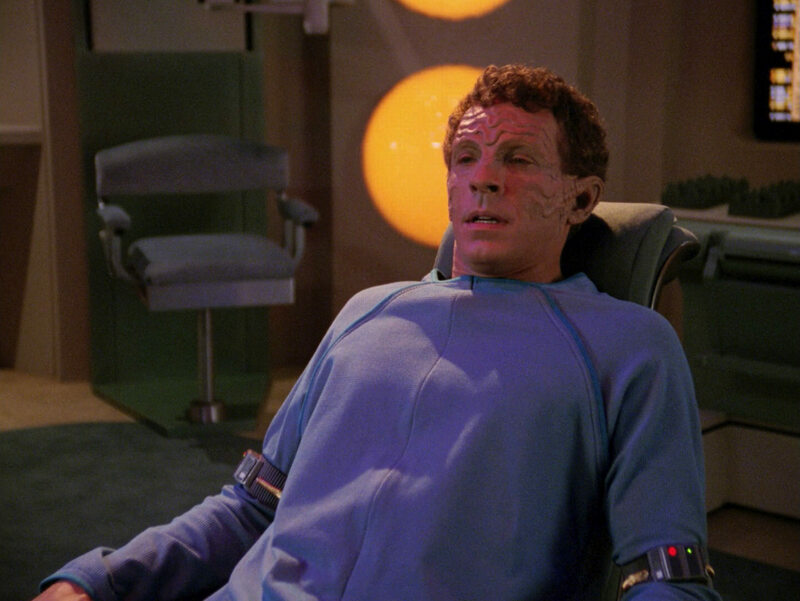 Medical readouts of John Doe's lifesigns. 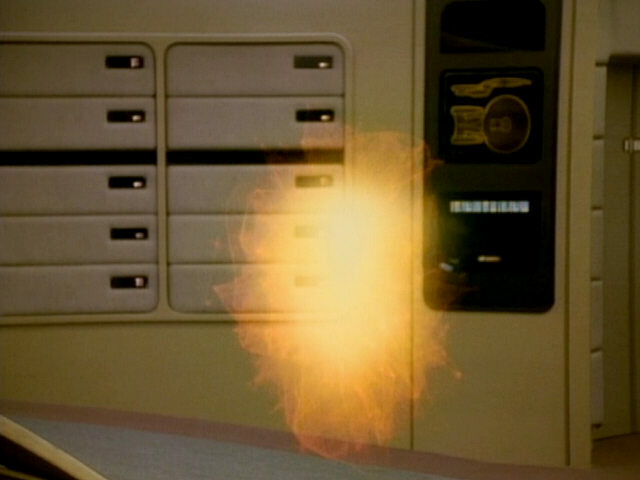 The small display, flashing red, was added in post production. 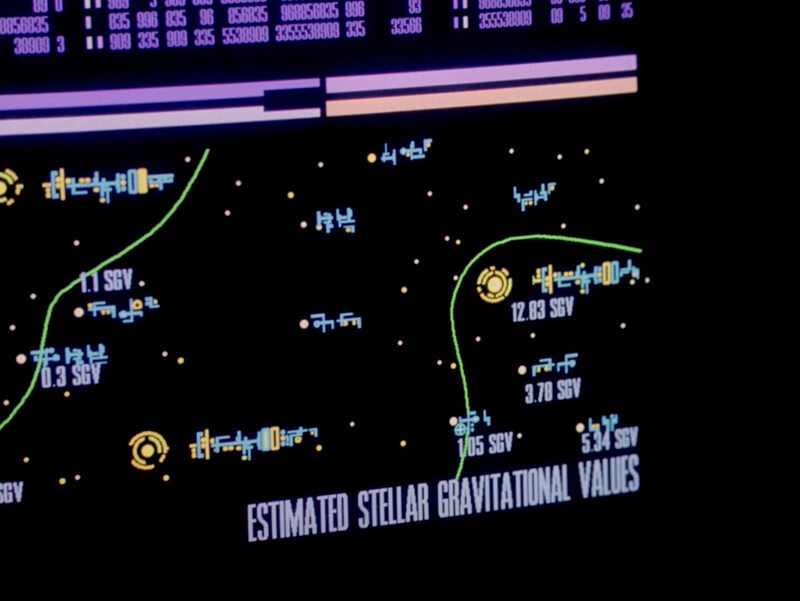 A good look at the display in HD. 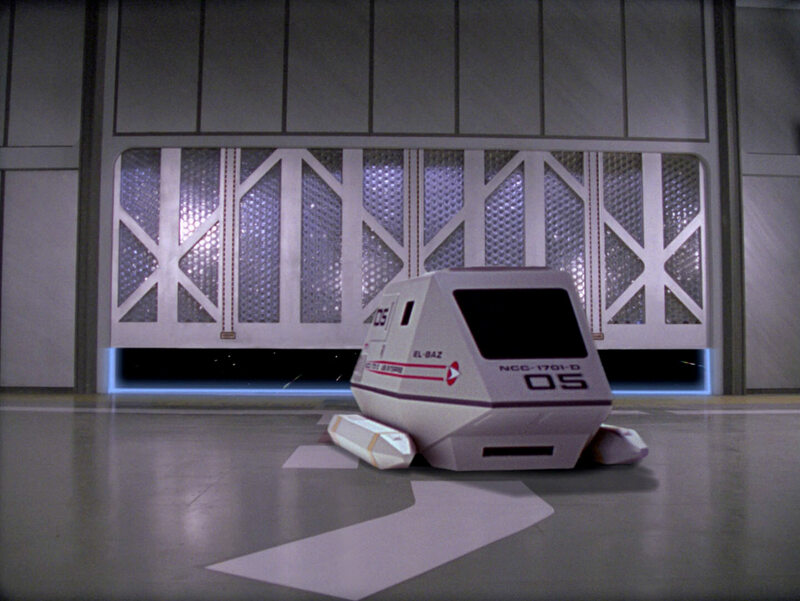 The shuttlebay control booth was added to the set for "Evolution". 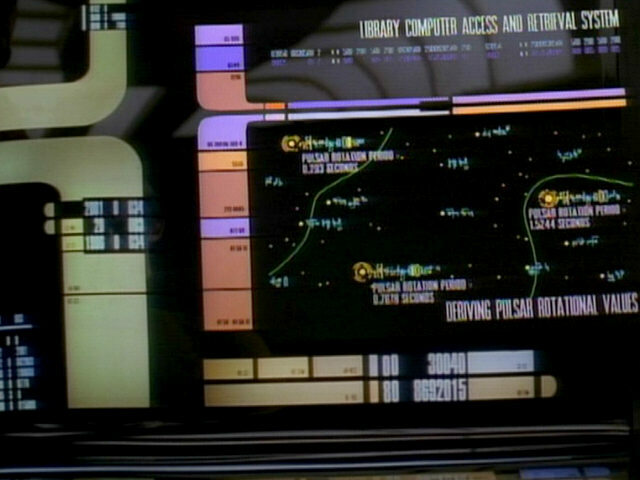 Much more of the set (and the graphic in the booth, listing the status of all Enterprise-D shuttles) can be seen in this episode. 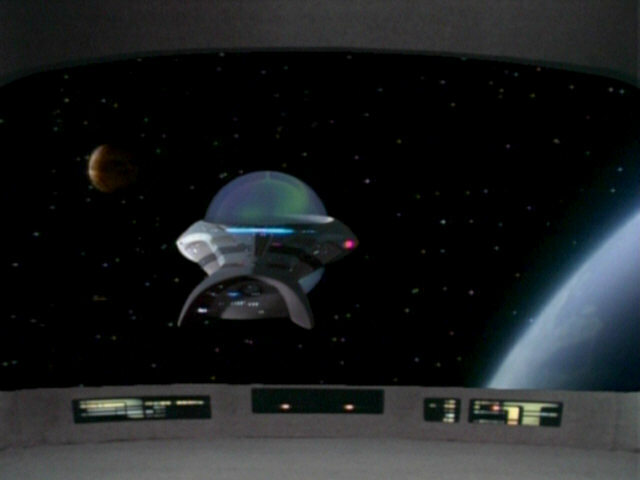 The set as it appears in HD. 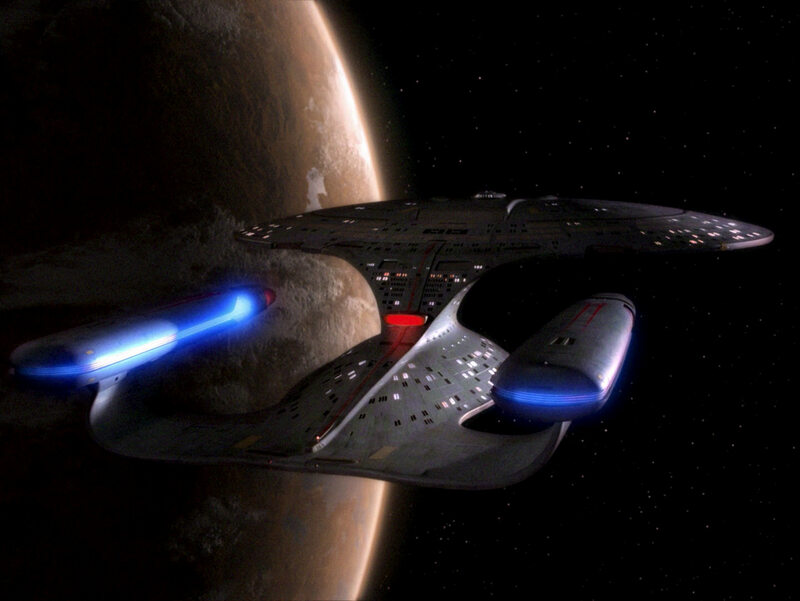 The footage of the shuttle was originally filmed for "Time Squared". 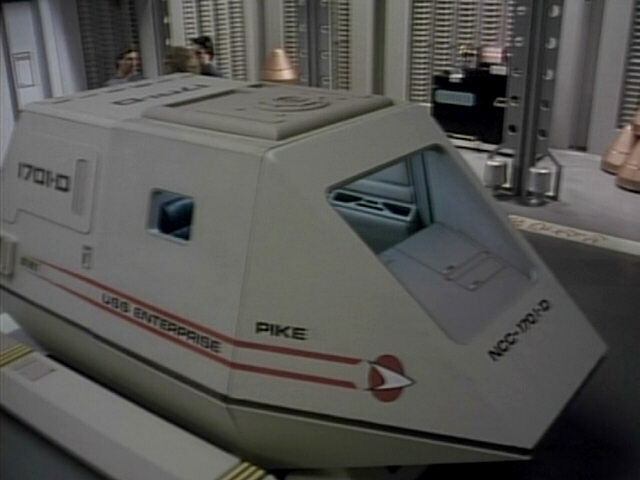 This is evidenced by the lettering on the hull, which has changed since that episode was filmed. 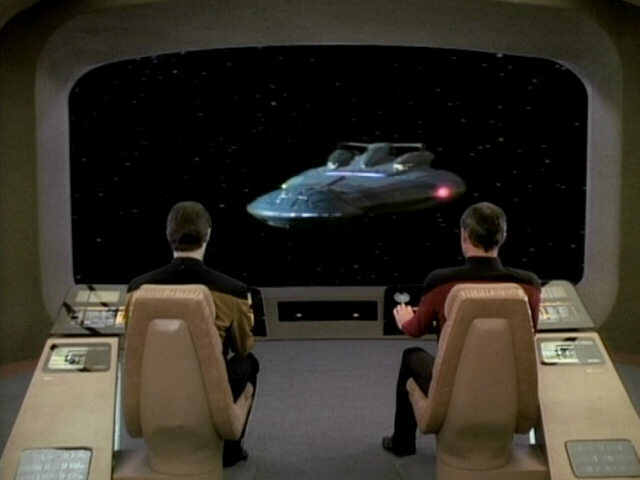 Like in the original episode, the footage of the shuttle was inserted into footage of the shuttlebay in post production. 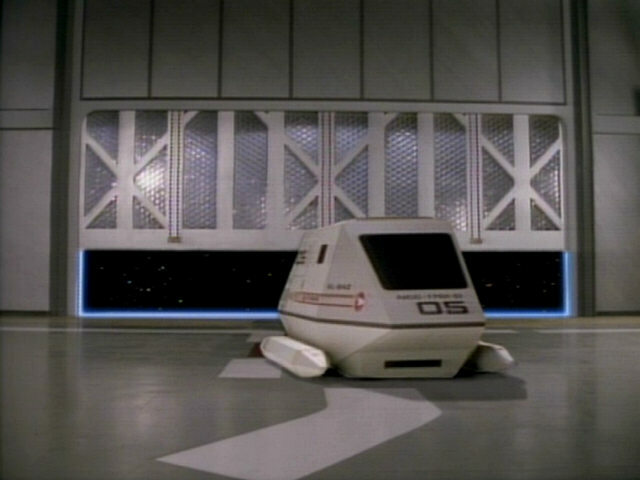 The footage of the opening shuttlebay doors has never been seen before. 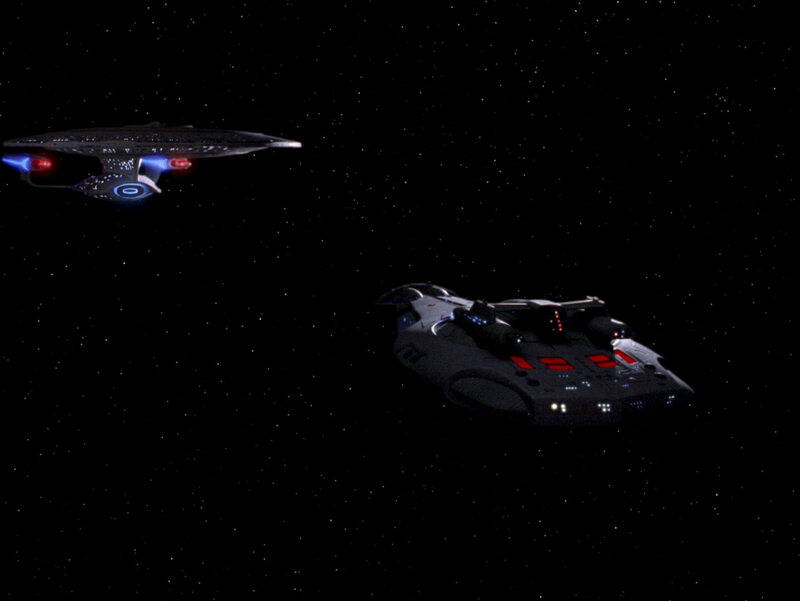 "Time Squared" The sequence in HD. 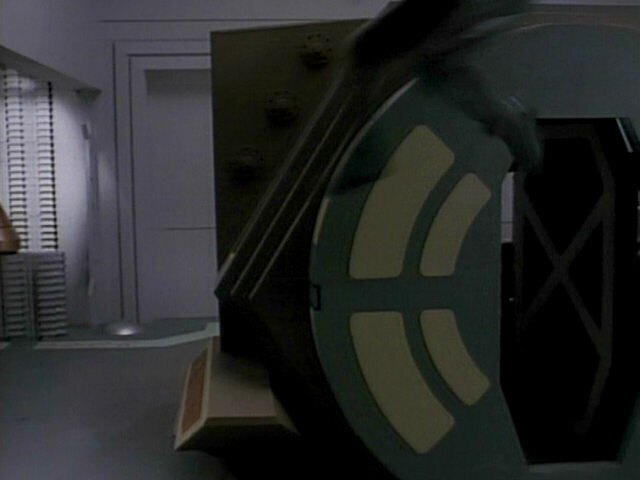 The Zalkonian ship is a modification of the Tarellian plague ship, seen in "Haven". 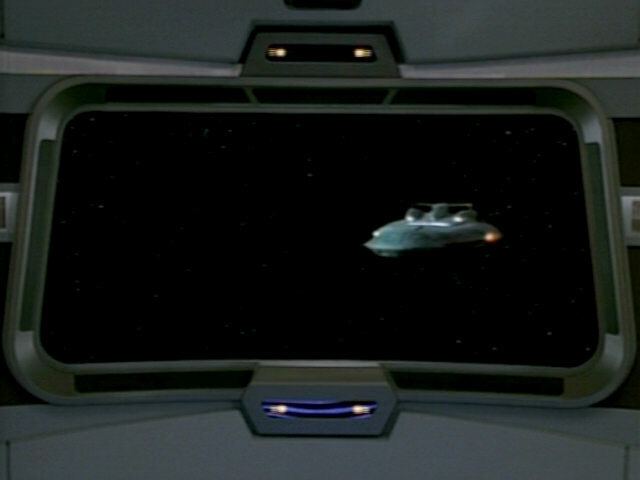 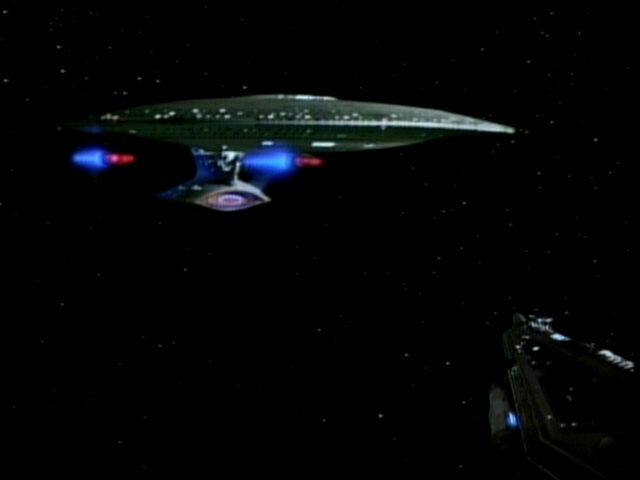 Footage of the ship approaching the Enterprise-D was re-used in the Voyager episode "Jetrel" where the ship appeared as a Haakonian shuttle. "Haven" We can recognize more details of the ship in HD. Its dorsal surface is not as smooth as it previously appeared. 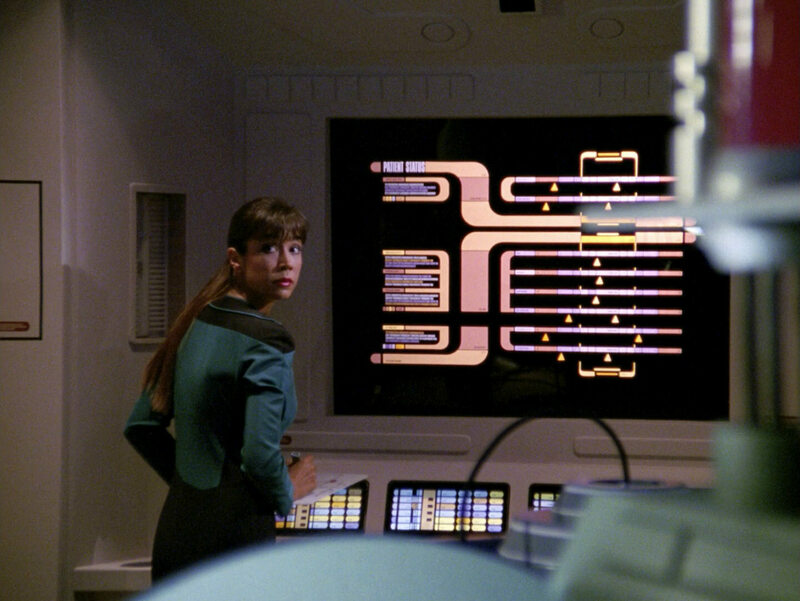 Two of the consoles on the Zalkonian ship previously appeared on Federation starships. 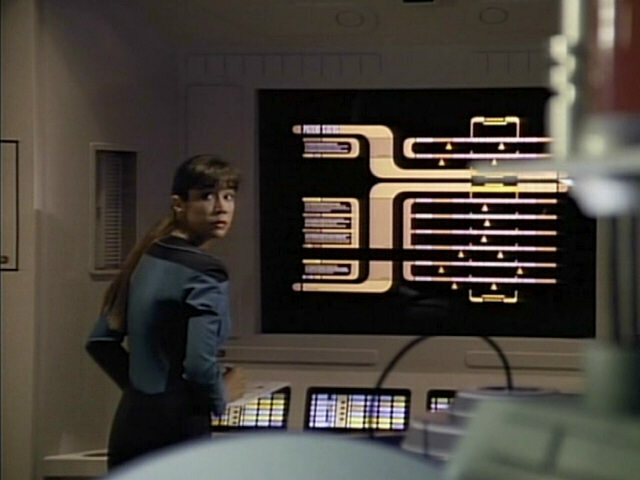 The console in the background was seen in the cargo bay in "Code of Honor" but also appeared on the bridge of the Atlec ship in "The Outrageous Okona". 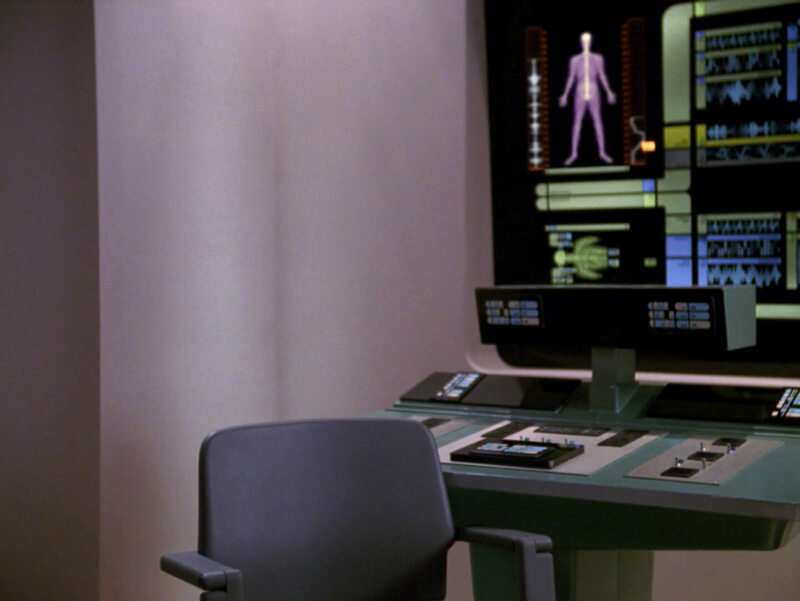 It was originally a sickbay console aboard the USS Enterprise in the first two Star Trek films. 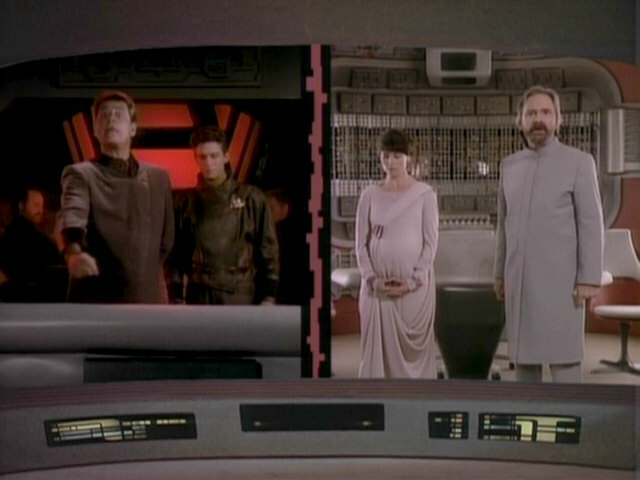 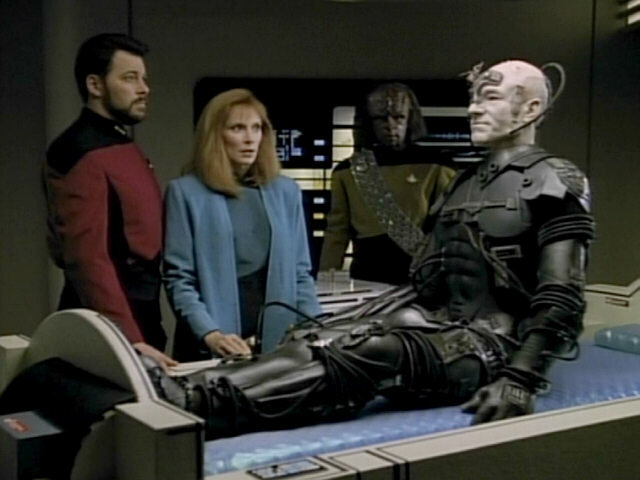 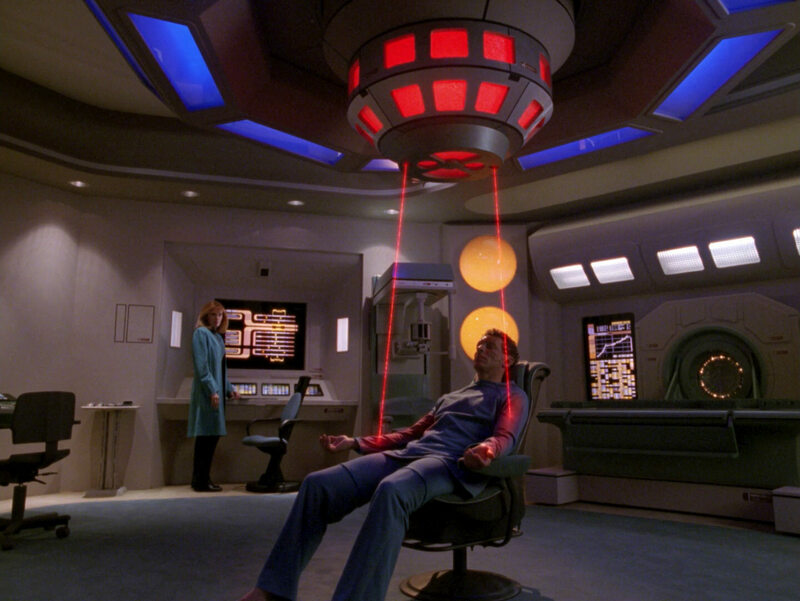 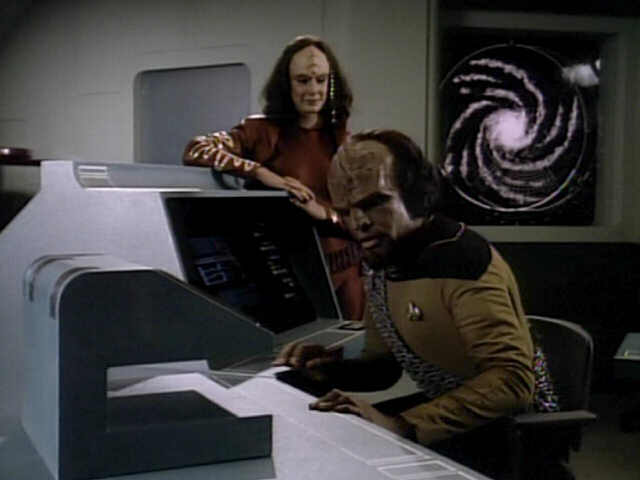 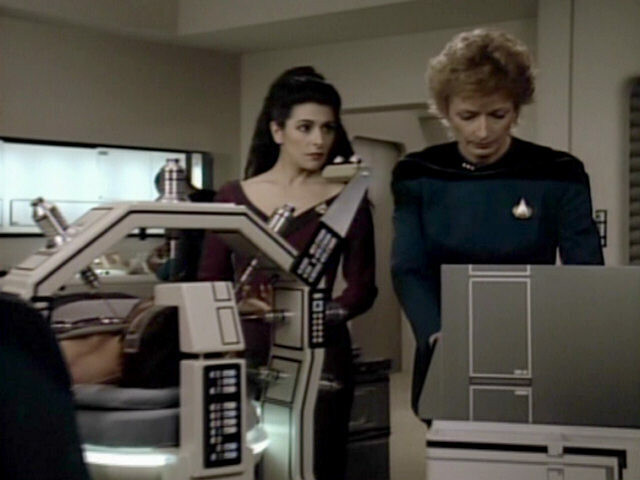 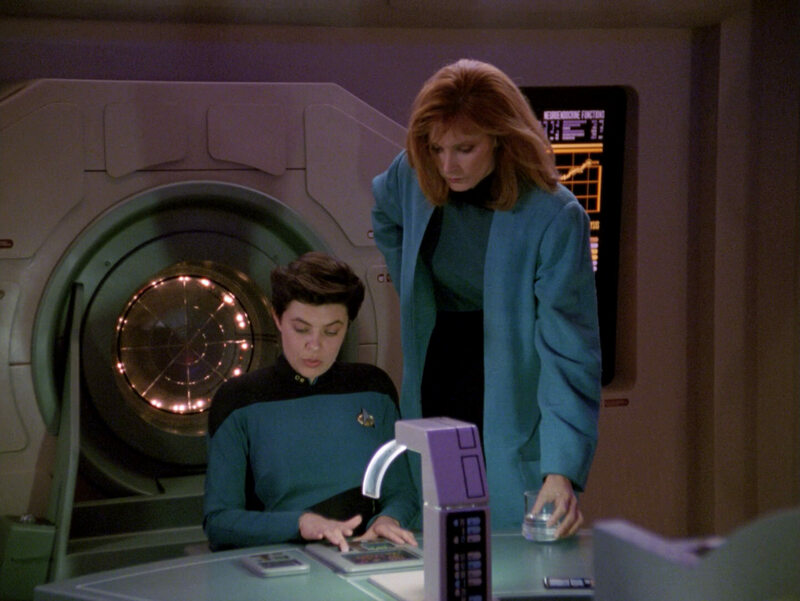 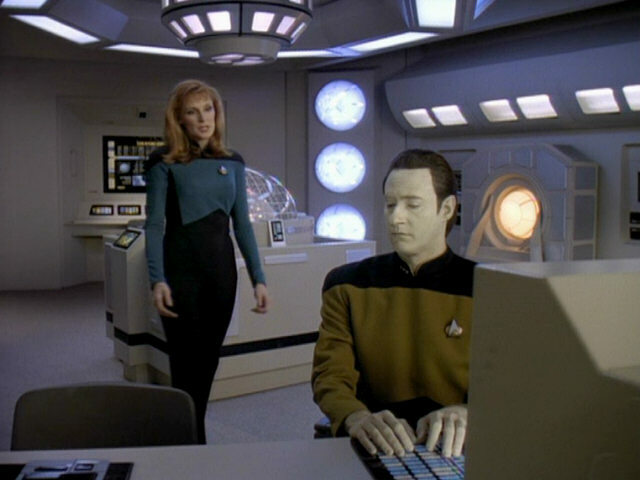 Consoles like the small one attached to the desk were seen in several earlier TNG episodes, like "The Emissary" and "Booby Trap". 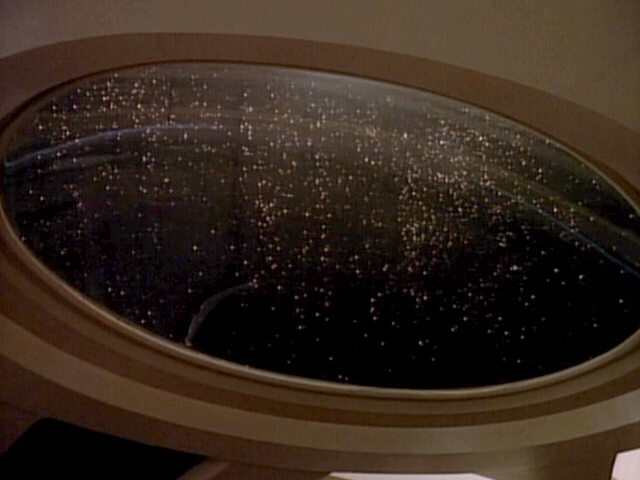 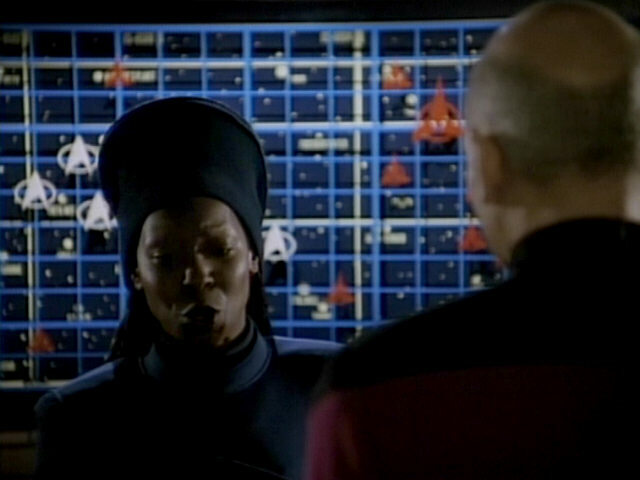 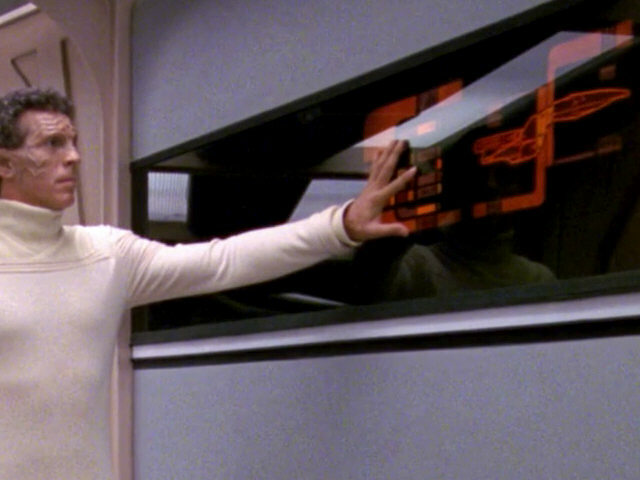 The transparent display seen through the "window" on the bridge first appeared on Risa in "Captain's Holiday". 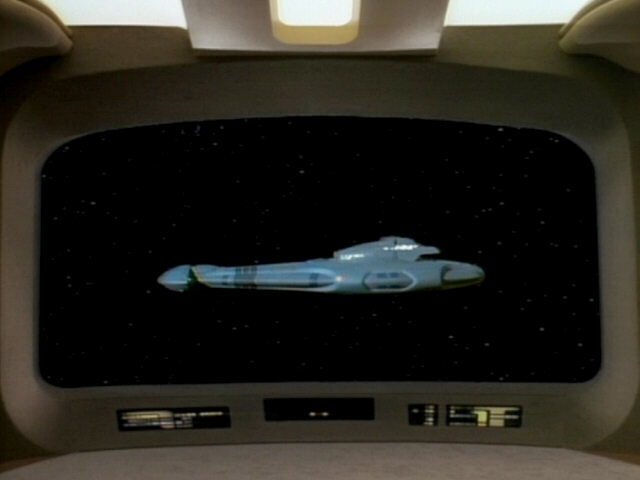 Okona" A good look at the Zalkonian bridge in HD. 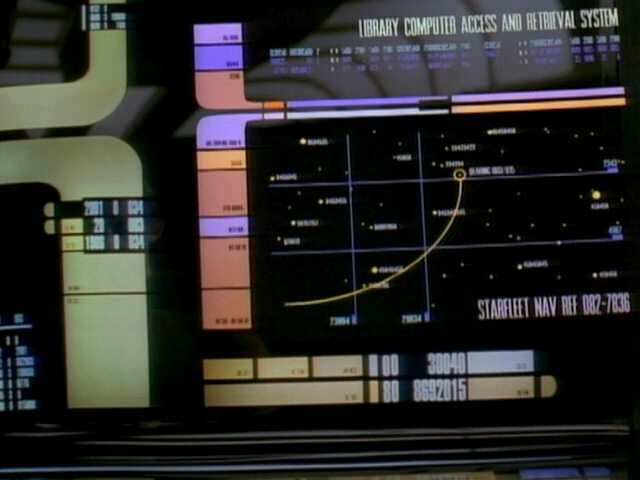 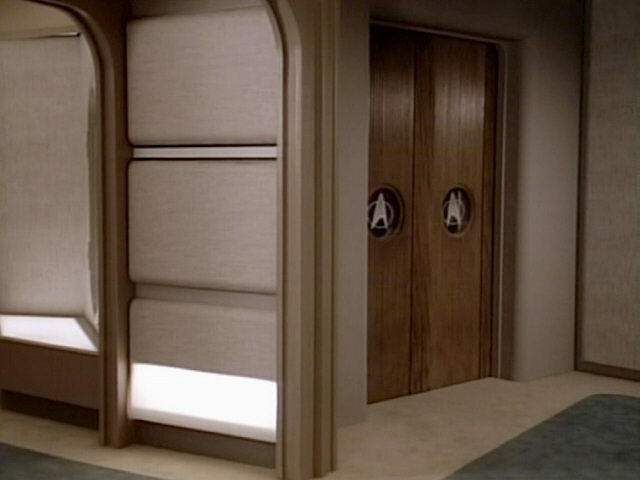 The star chart seen behind the Risian glass interface was originally seen in Picard's ready room aboard the alternate USS Enterprise-D in "Yesterday's Enterprise". 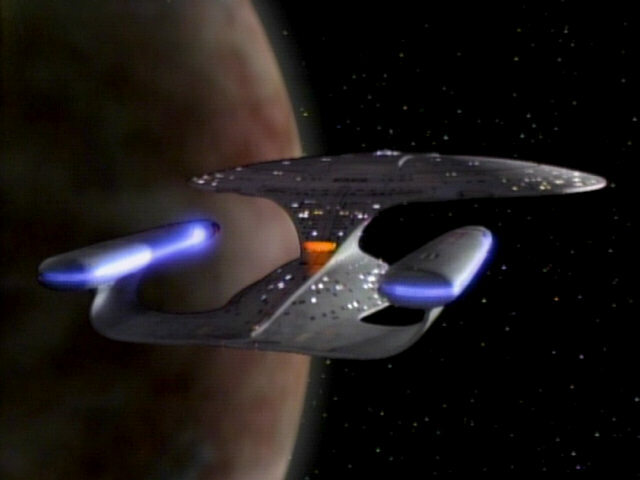 It also appeared in Maxwell's ready room aboard the USS Phoenix in "The Wounded". 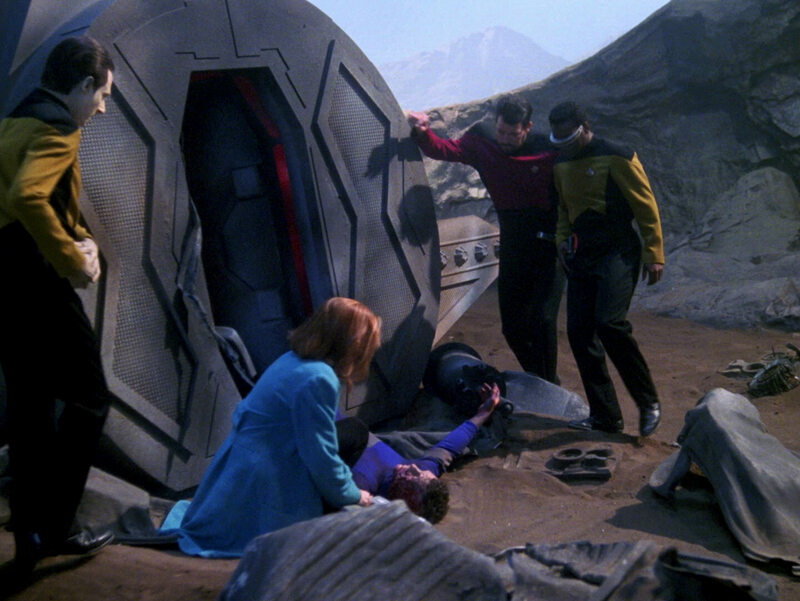 "The Wounded" Owing to the depth of field, we can't recognize more details on this display in HD. 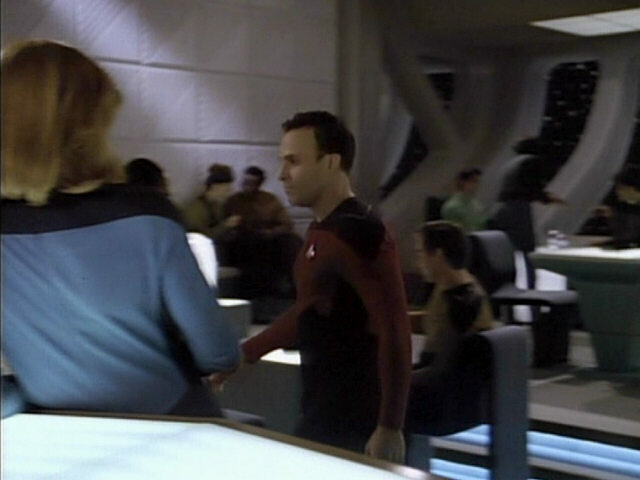 But we can see the complex ornaments on Sunad's uniform. 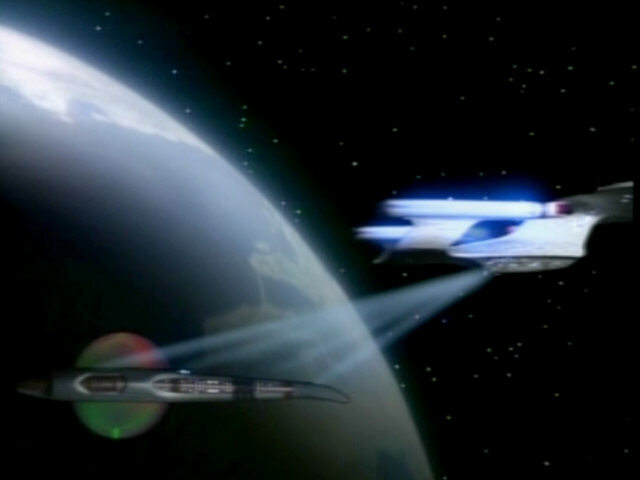 This footage of the Zalkonian starship facing the USS Enterprise-D was re-used in "The Game", as the Ktarian ship appearing in that episode was filmed using the same filming miniature. 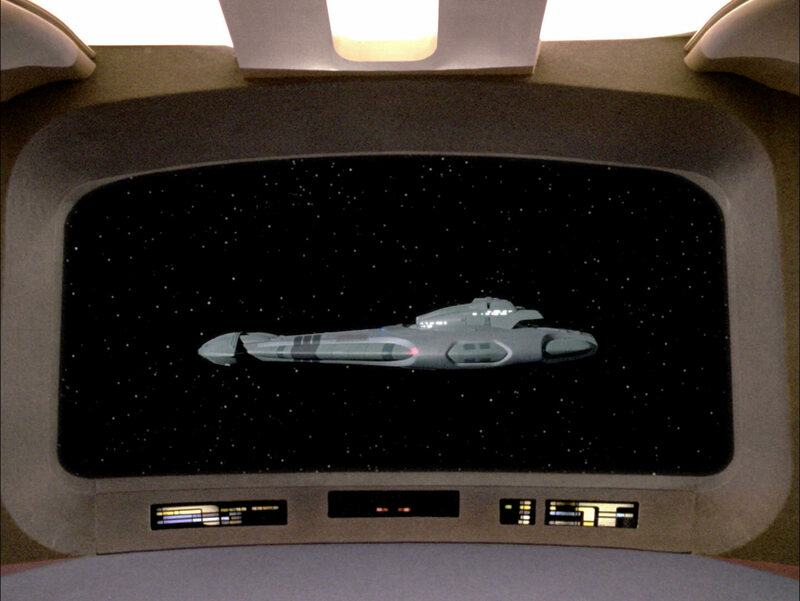 A shot of the Tarellian plague ship from a similar angle shows what the model looked like before modification. 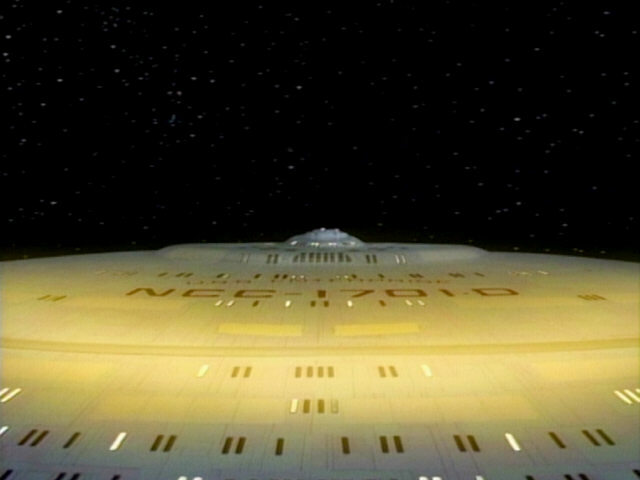 The shot of the USS Enterprise-D is new, it was filmed using the 4-foot model. 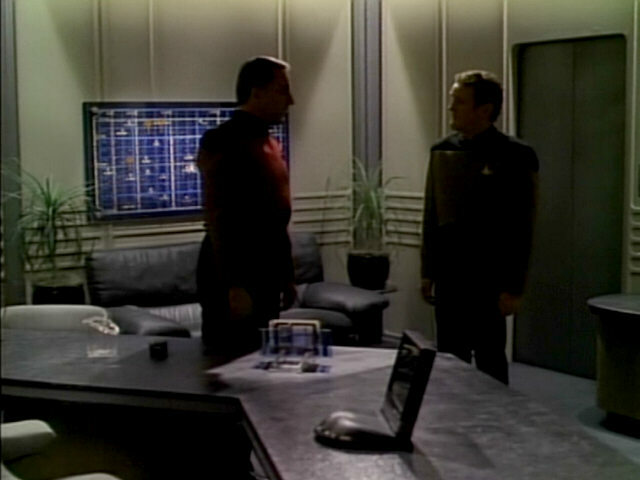 Compare this to similar shots of the 2-foot model ("The Ensigns of Command") and 6-foot model ("The Vengeance Factor"). of Command" We can recognize more details of the ship in this HD shot too. 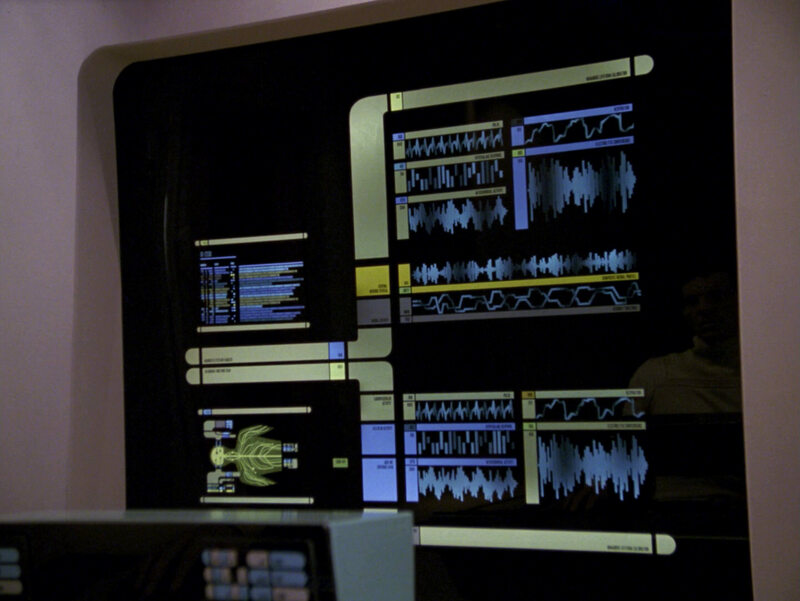 An LCARS display of the USS Enterprise-D is switched on when John Doe sends an energy wave through the ship. 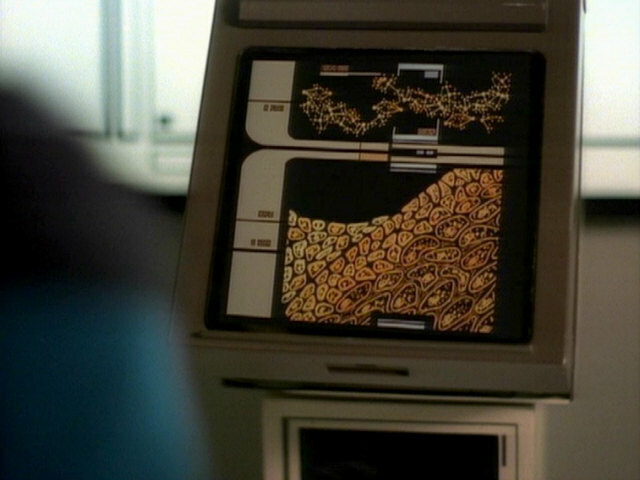 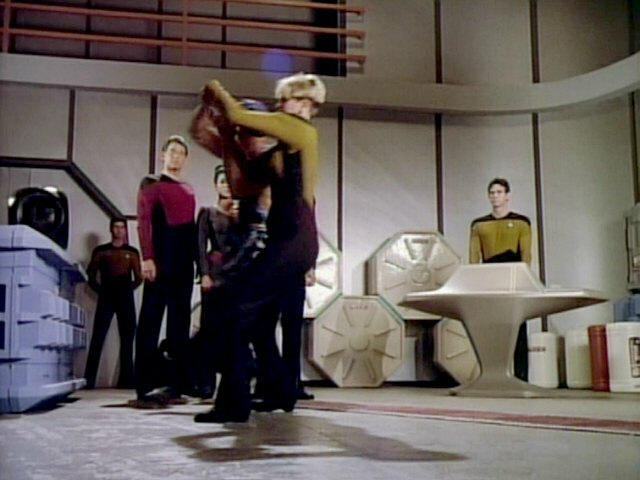 It is similar to the display Riker uses in "Encounter at Farpoint". 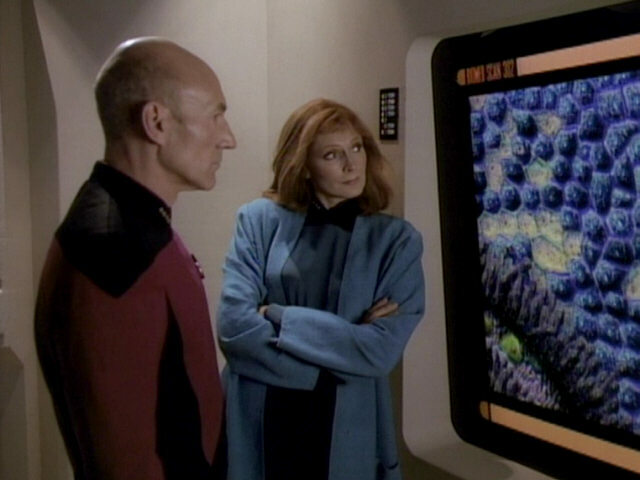 at Farpoint" An HD close-up of the display. 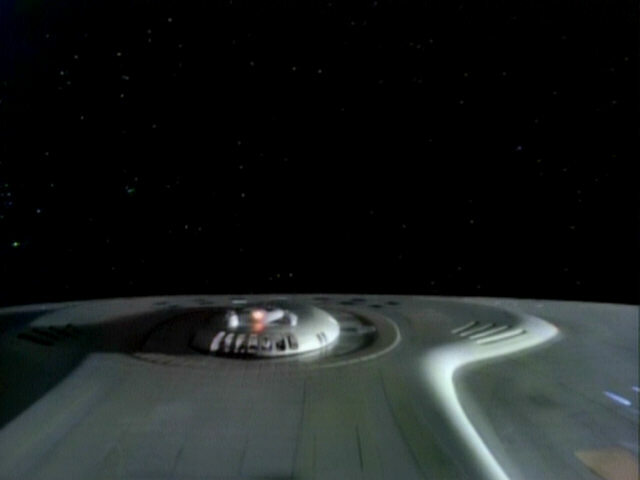 The shot of the energy wave moving over the hull of the saucer section is a freeze frame from a shot of the model filmed for "Encounter at Farpoint" and fully seen in "Conspiracy". 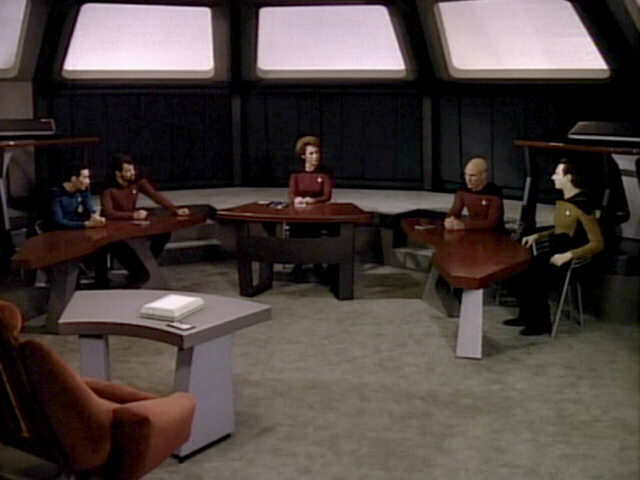 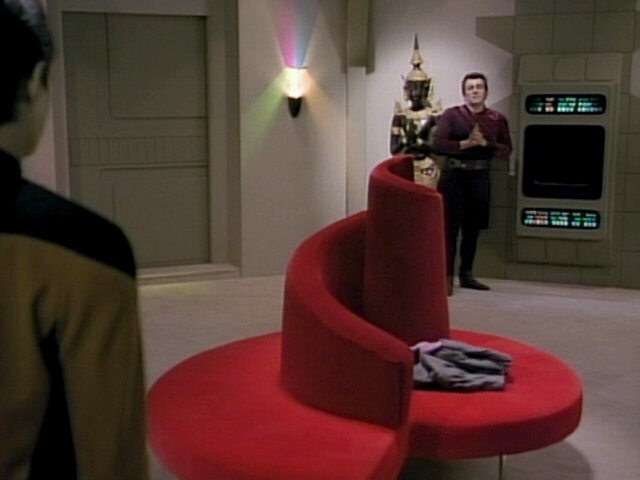 "Conspiracy" The effect in TNG-R.
Sunad's desk aboard the bridge of his ship was originally created for the courtroom in "The Measure of a Man". 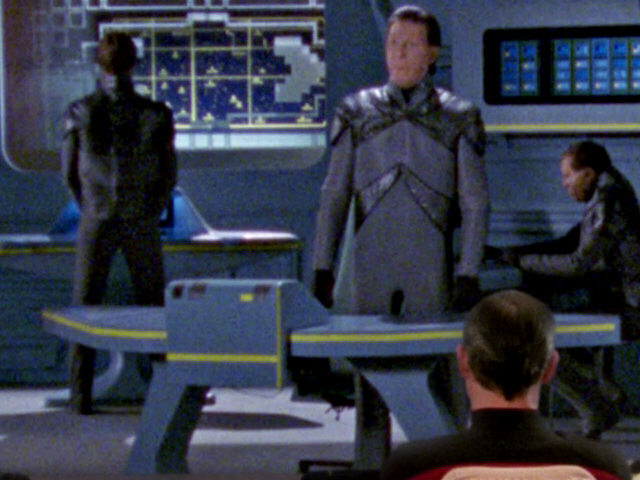 of a Man" An HD close-up of the desk. 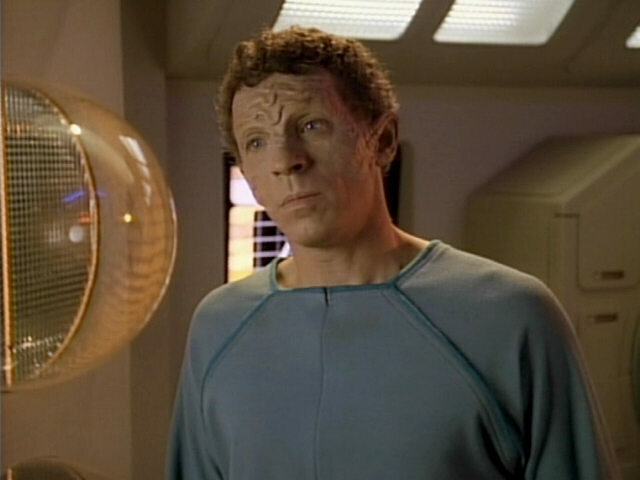 John Doe has transformed into the next evolutionary stage of the Zalkonians. 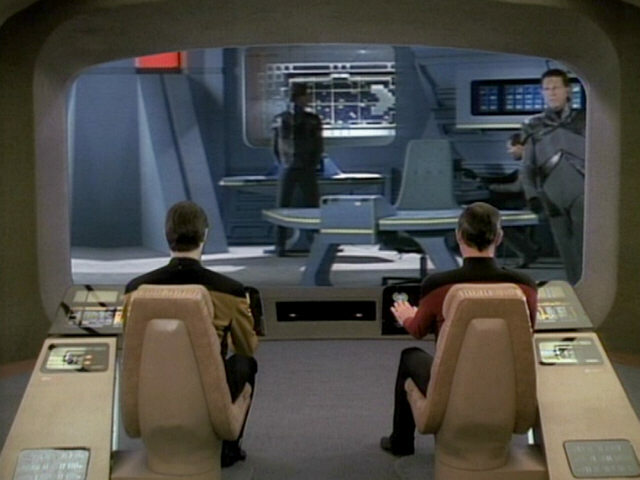 The effect in TNG-R, and another good look at Sunad's uniform. 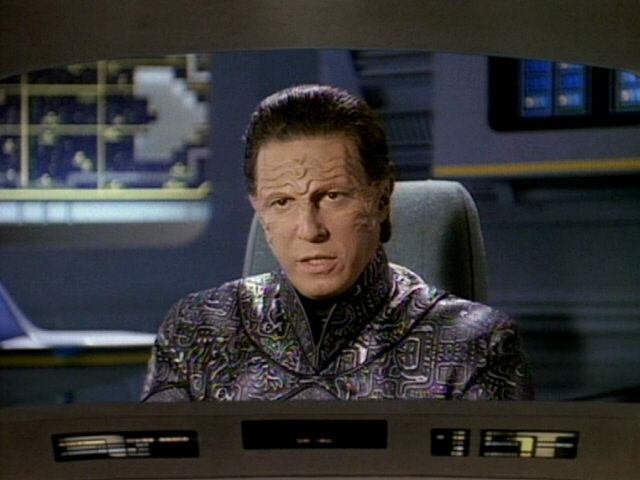 The Zalkonian military uniform later appeared in a couple of DS9 episodes. 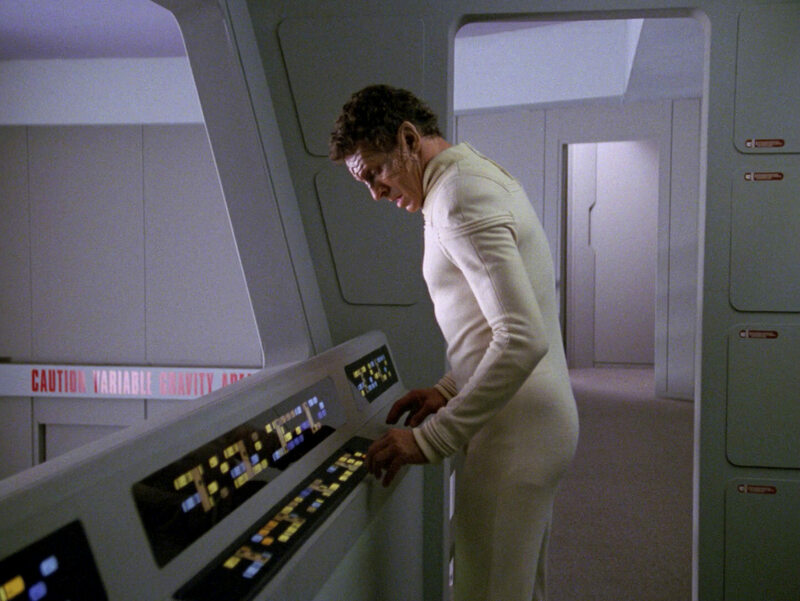 It was worn by several Dopterians on the show. 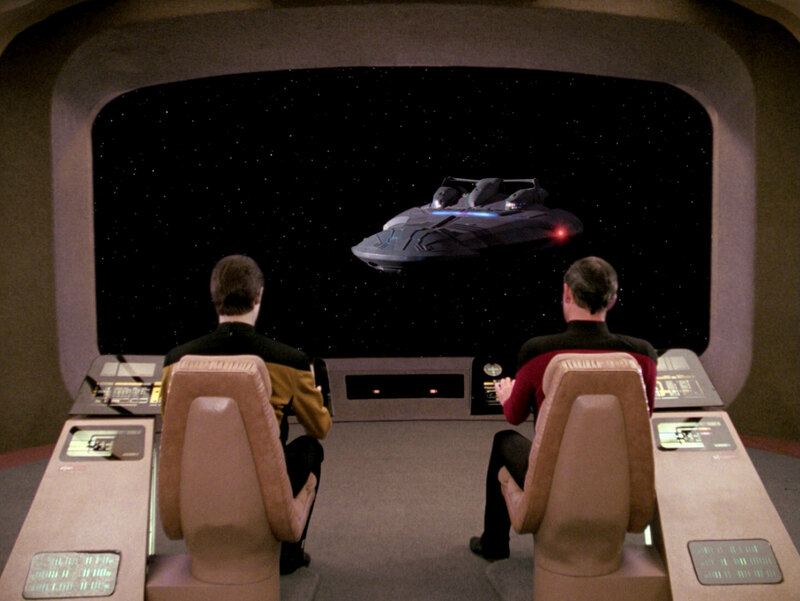 The Zalkonian starship flies away. 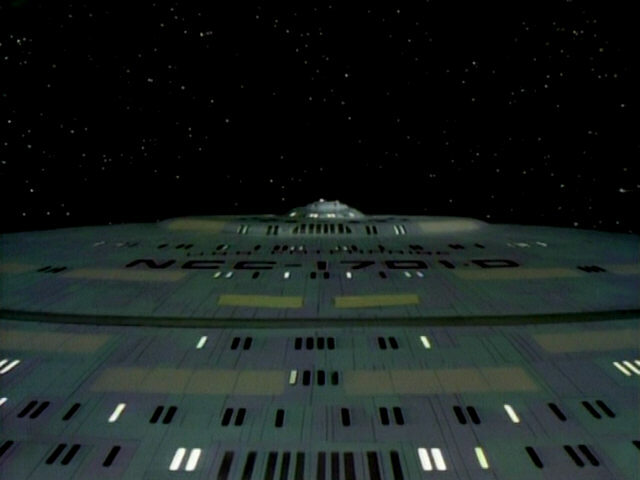 A screenshot from "Haven" shows what the Tarellian plague ship looks like from a similar angle. 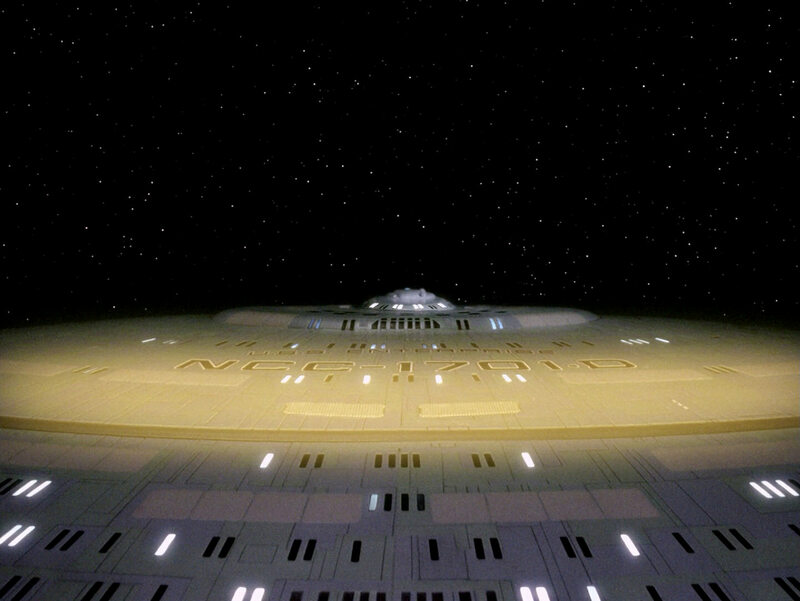 "Haven" A good look at the port side of the ship in HD. 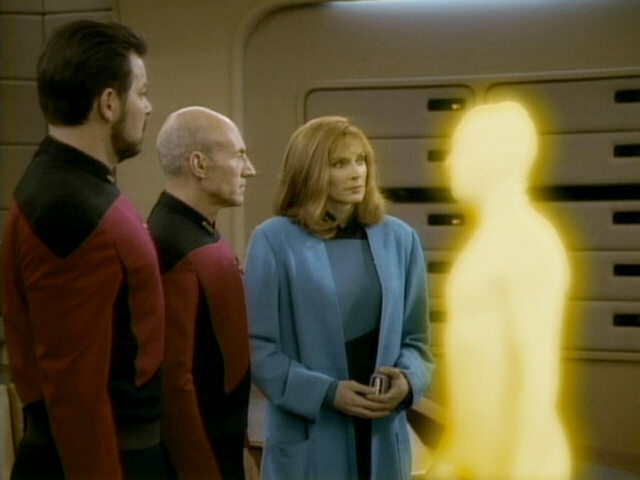 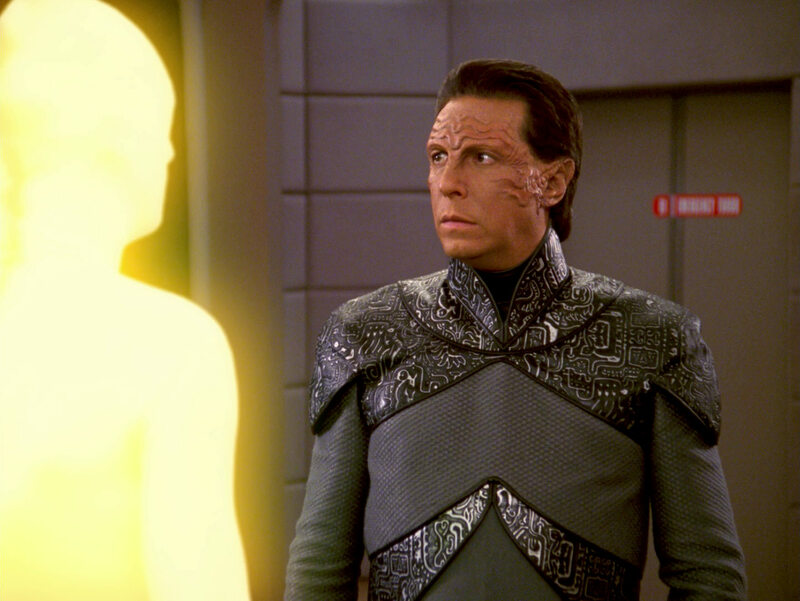 John Doe's light illuminates the faces of the Starfleet crew. 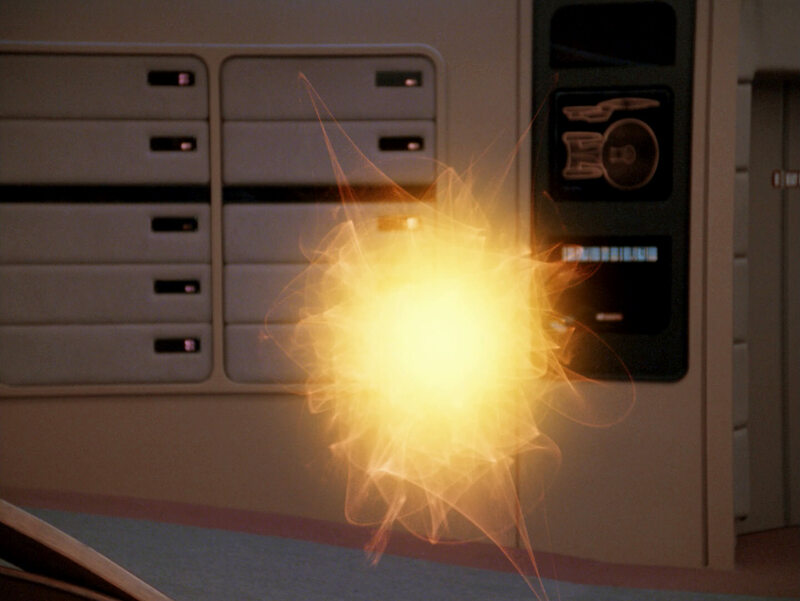 The reconstructed light effects. 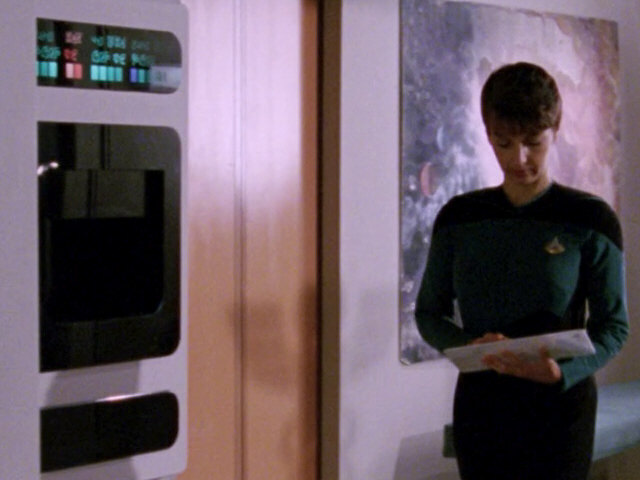 Note on the second still that the light ball is more intricate in TNG-R. 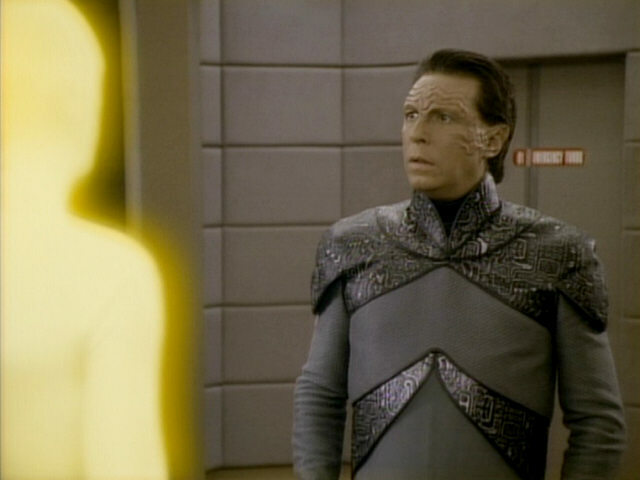 The completely non-corporeal stage of Zalkonian evolution. 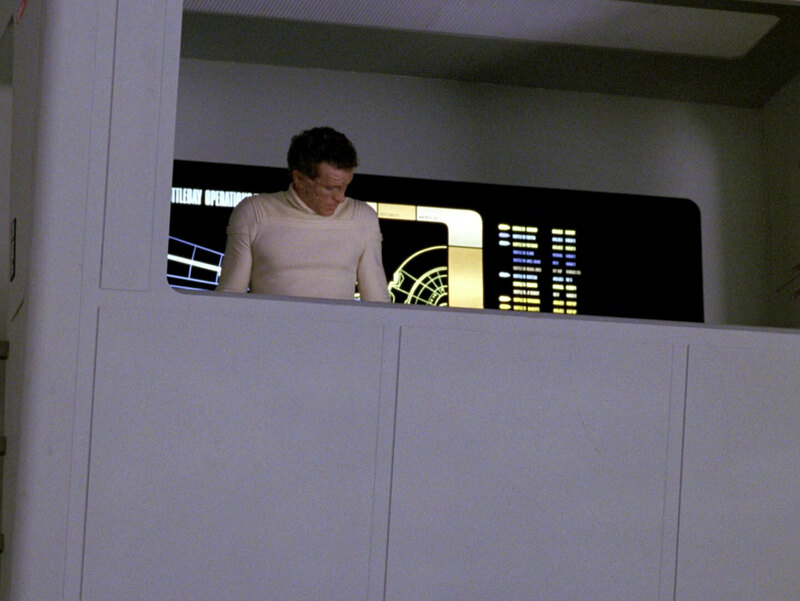 One of the rare cases when the large ceiling window on the bridge of the USS Enterprise-D is fully seen. 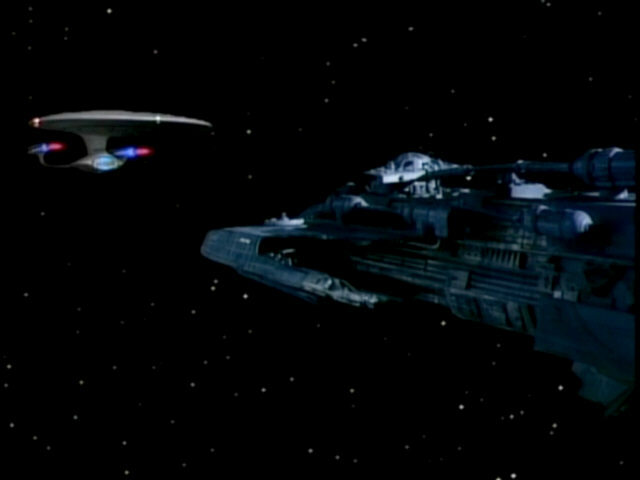 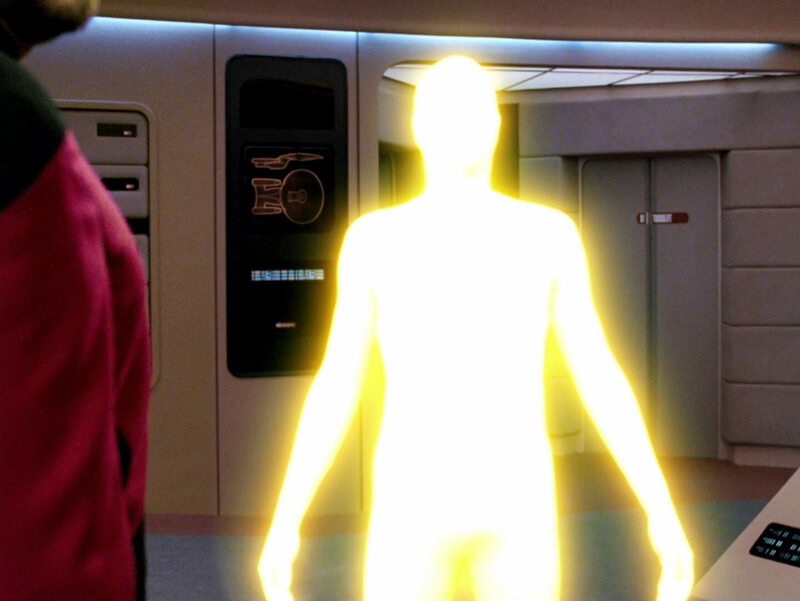 The shot of John Doe leaving the USS Enterprise-D is a freeze-frame from the opening credits of TNG. 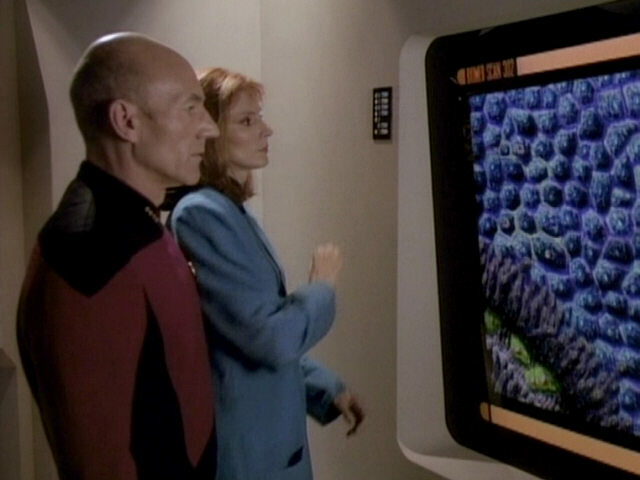 In this shot, the observation lounge is lit blue and the footage of the small moving figures is not inserted into the shot. 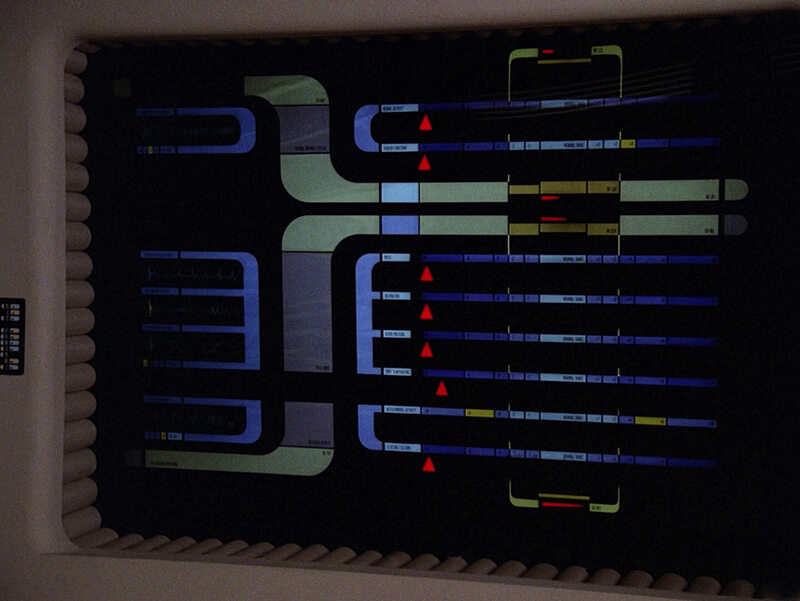 As can be seen, the lights on top of and around the bridge module were modified a little. 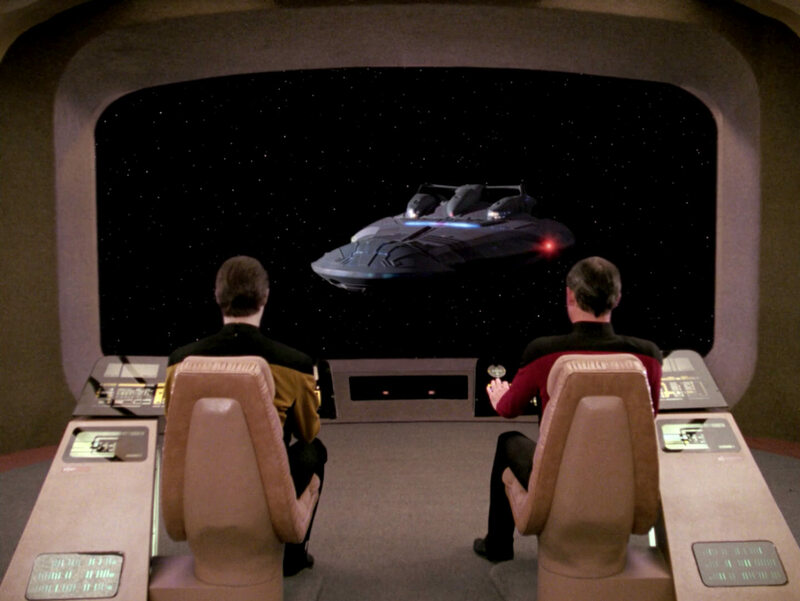 Opening credits The shot still looks the same in TNG-R.